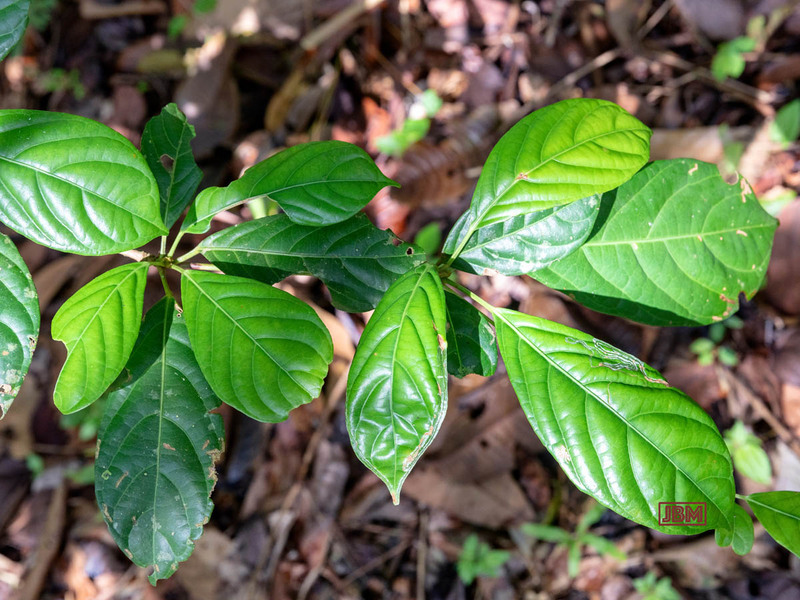 There are over 100 different species in the genus Baccaurea, which are mostly found from Thailand and Indonesia across to the western Pacific. 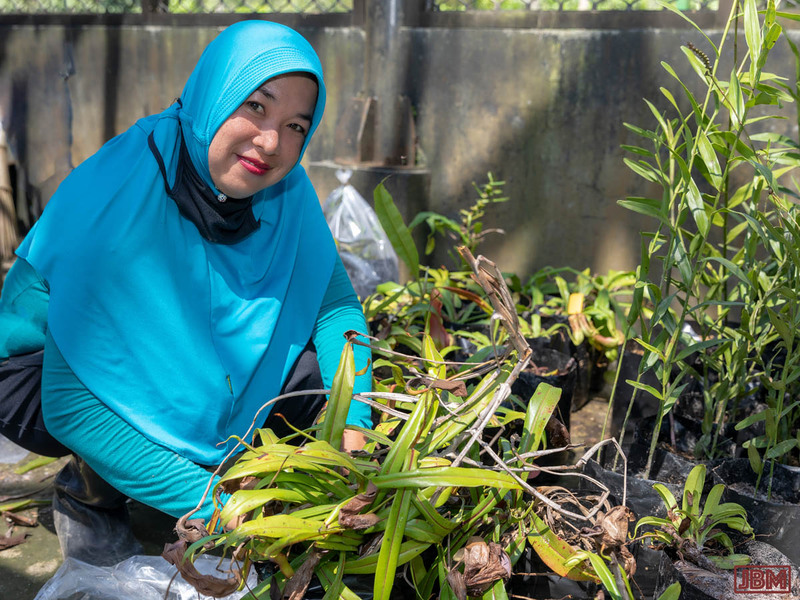 At the Kebun Raya Balikpapan (‘KRB’ – the Balikpapan Botanical Garden) there are 99 specimens from four identified species in the collection, as well as a number of others whose precise identity has yet to be determined. This one is Baccaurea parviflora Müll.Arg., which is known in Banjar language (along with some other species of Baccaurea) as ‘rambai’. 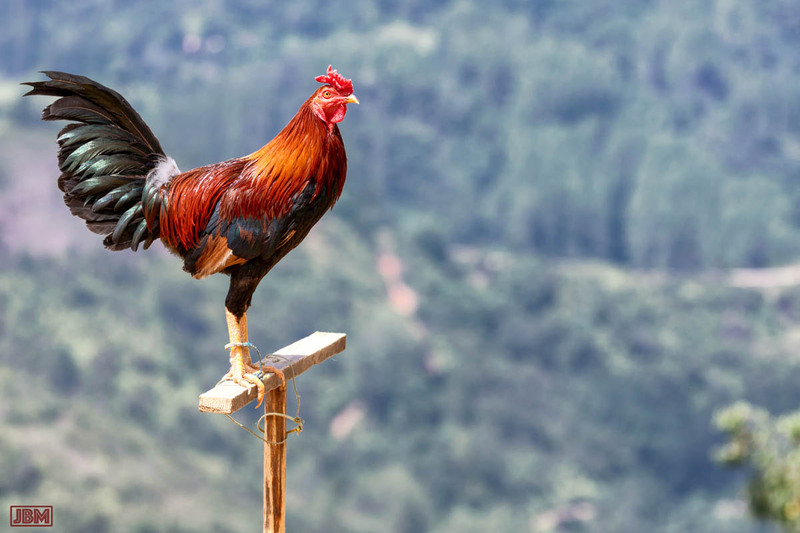 In the Indonesian (and Malaysian) language it’s called ‘setambun’. 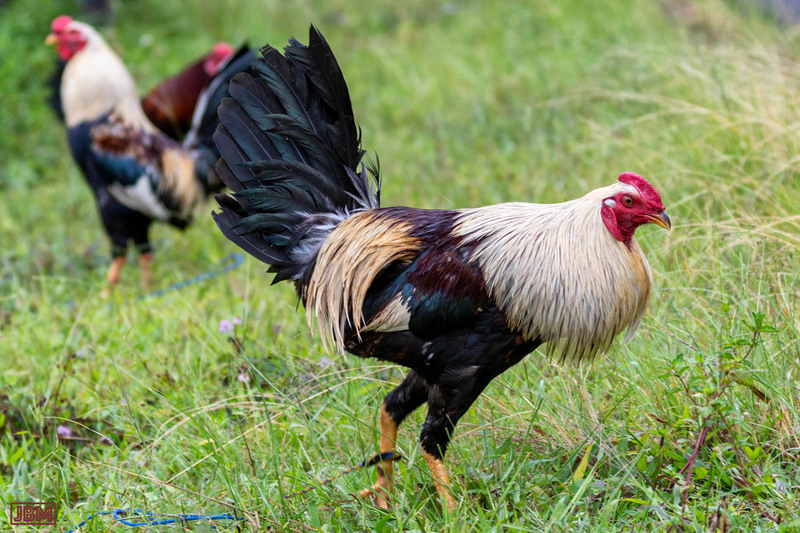 It’s locally common from Thailand through to the islands of Sumatra and Borneo. 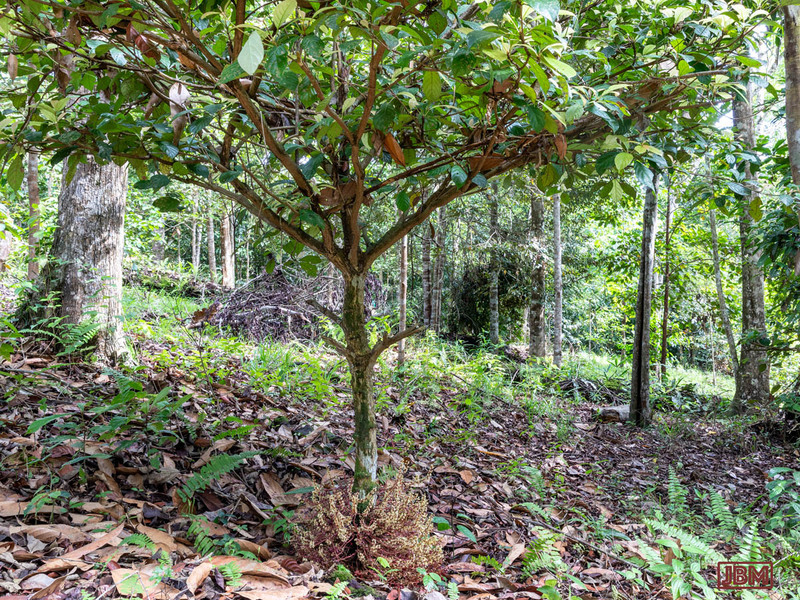 It grows as a shrub or small tree, up to a height to 15 metres, though usually less. So it’s an understorey tree in the rainforest, way down below the height of the big canopy trees, and the even bigger emergent trees. This one at the KRB, which was planted out as an established seedling in 2008, is currently about four metres tall. The fruit can be eaten, though it’s acidic. Apparently it’s best when cooked. The hard timber is used to make tools and boxes and the like. 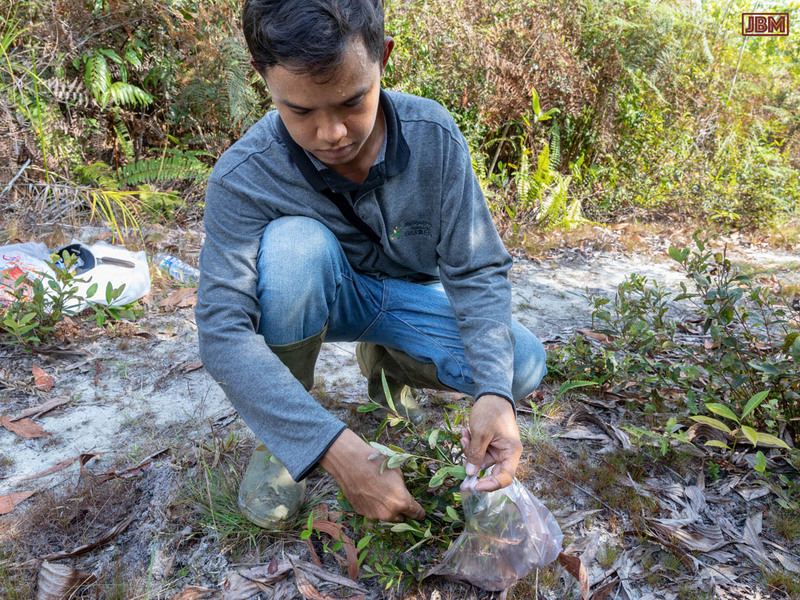 There are 15 Baccaurea parviflora specimens in the collection of the KRB, all of which were collected back in June 2006 from the nearby Sungai Wain Protected Forest (Hutan Lindung Sungai Wain). 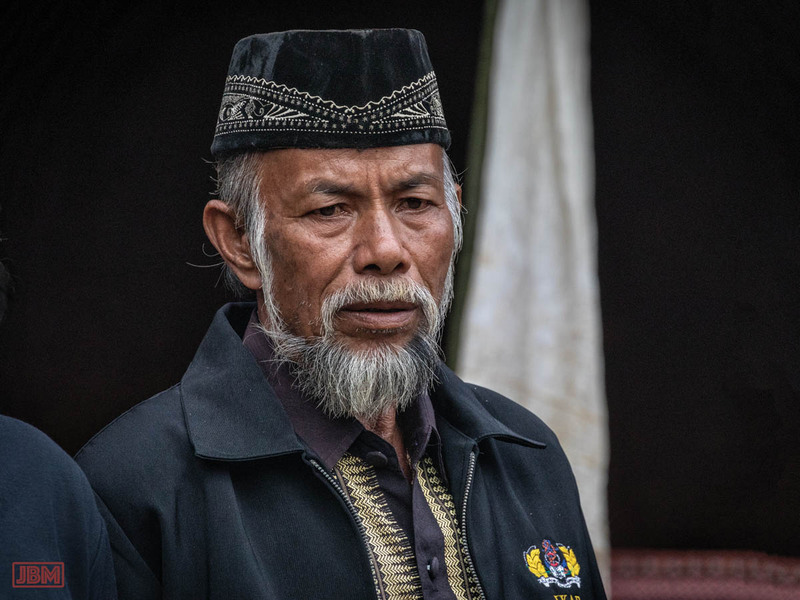 The seedlings were found and brought to the KRB by the esteemed Pak Trisno. There are a couple of slightly unusual things about this plant. It’s ‘dioecious’, meaning that there are distinct male and female plants, with both (unsurprisingly!) required for pollination and reproduction. The flowers grow as ‘inflorescences’, directly out of the main trunk of the tree. 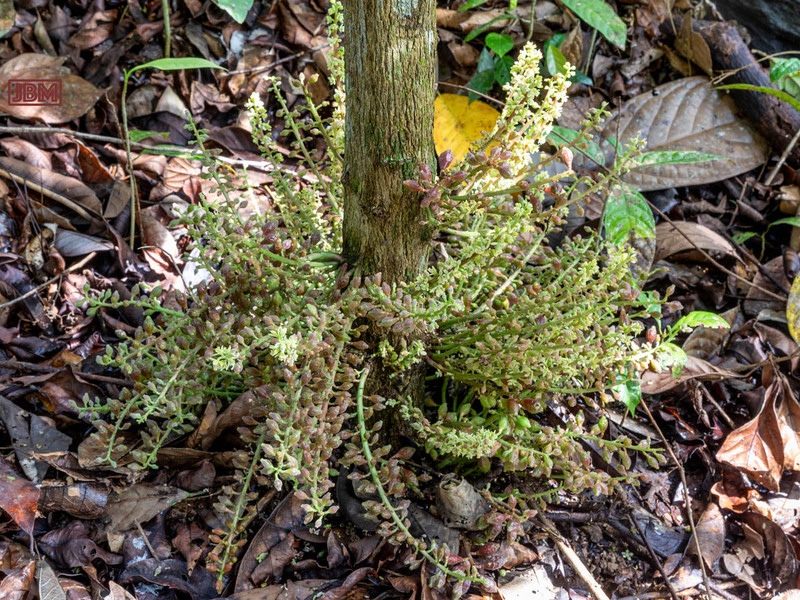 The flowers of the female Baccaurea parviflora are located just above ground level. 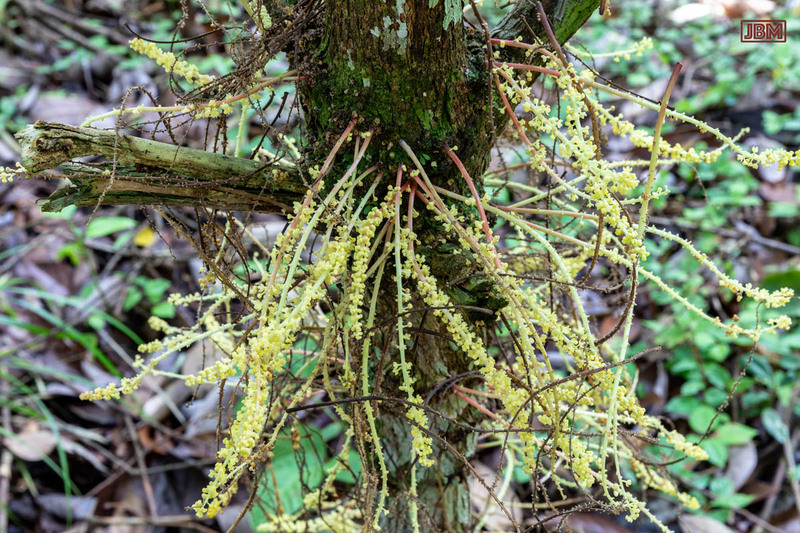 The male flowers also grow on inflorescences, which can appear anywhere on the trunk of the tree. 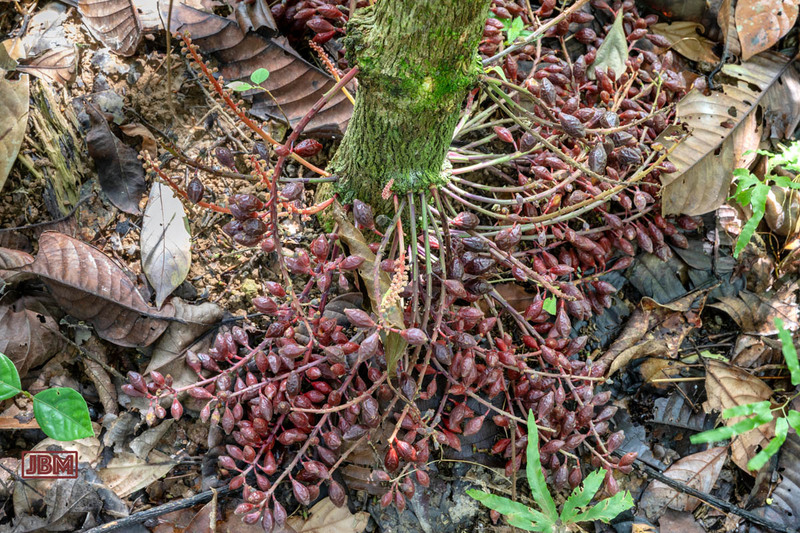 When the dark red berry fruits form, they just lie on the ground at the base of the tree. 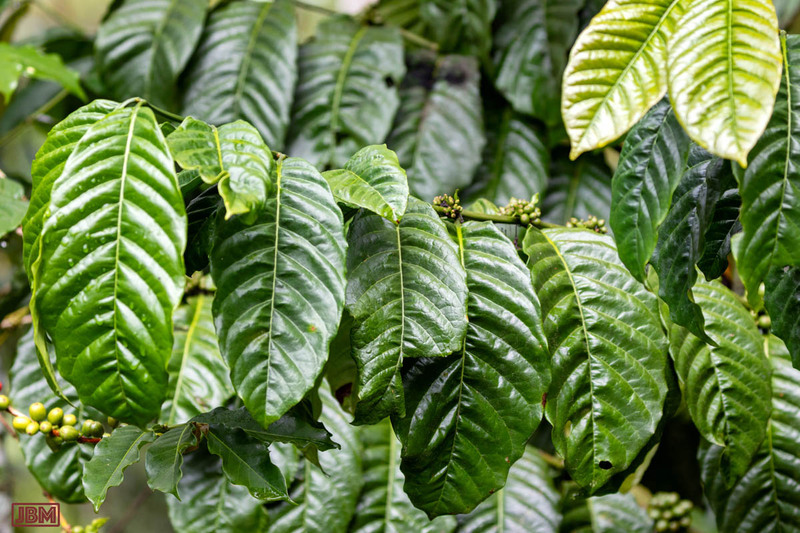 The large and attractively glossy leaves grow singly, and are sort-of elliptical in shape. 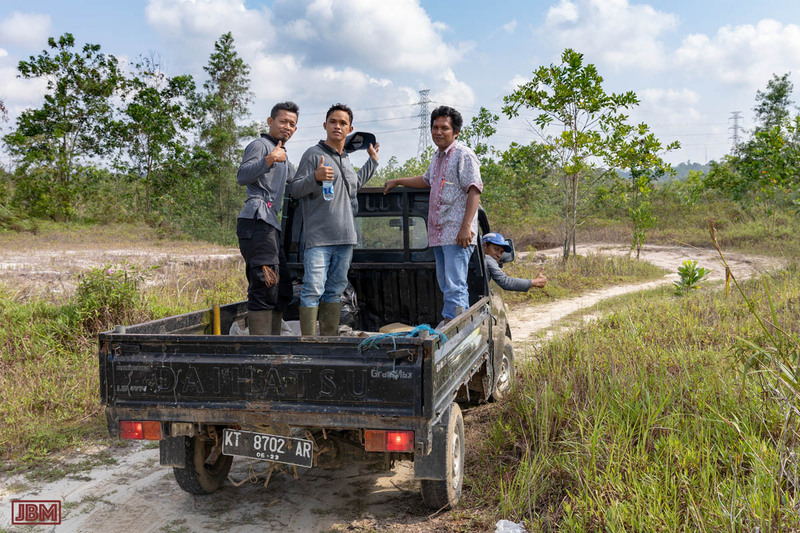 On Wednesday I travelled with workmates from the Kebun Raya Balikpapan (Balikpapan Botanical Gardens) to collect plant specimens from the nearby region of Kariangau. Despite the even-more-than-usually hot weather, it was a really enjoyable and very interesting little expedition. 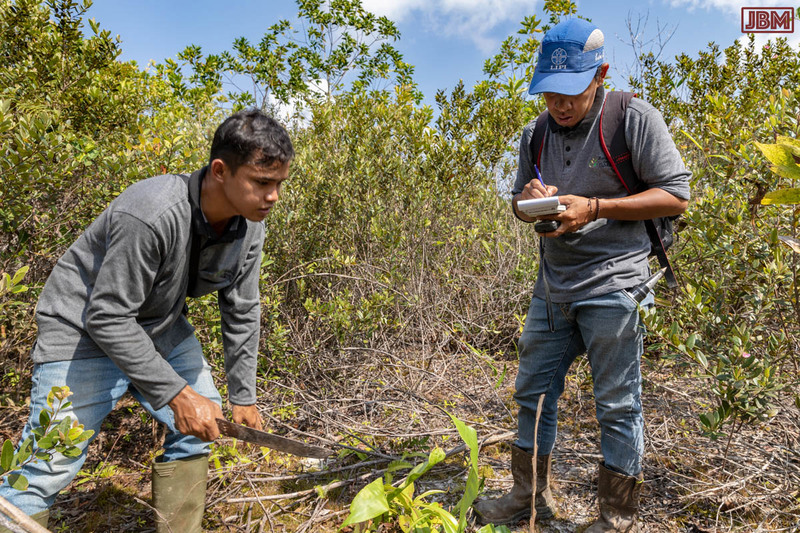 It’s only about ten kilometres away from the lowland Dipterocarpus rainforest that characterises the Kebun Raya, but it’s a very different environment, known in Borneo as ‘kerangas’. 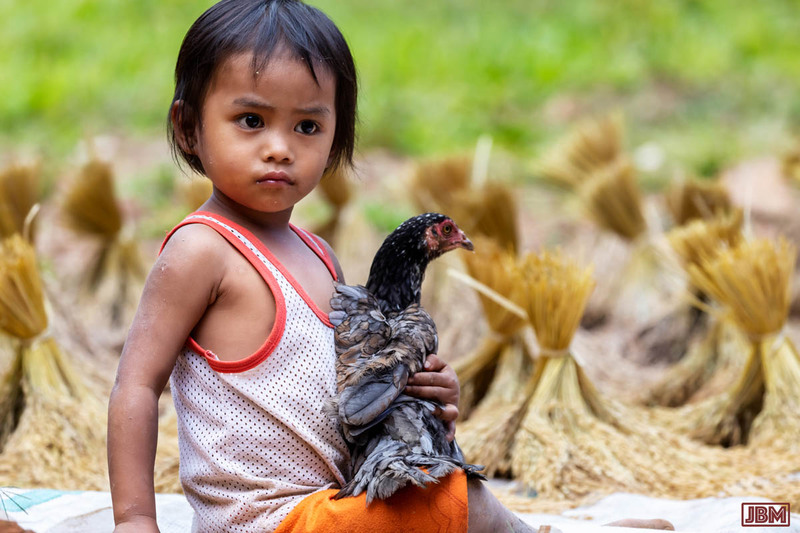 The word comes from the Dayak Iban language of West Kalimantan, and it literally means “land that can’t be used to grow rice”. It’s heathland, with nutrient-poor, sandy soils, no large trees, but many unique plant species. 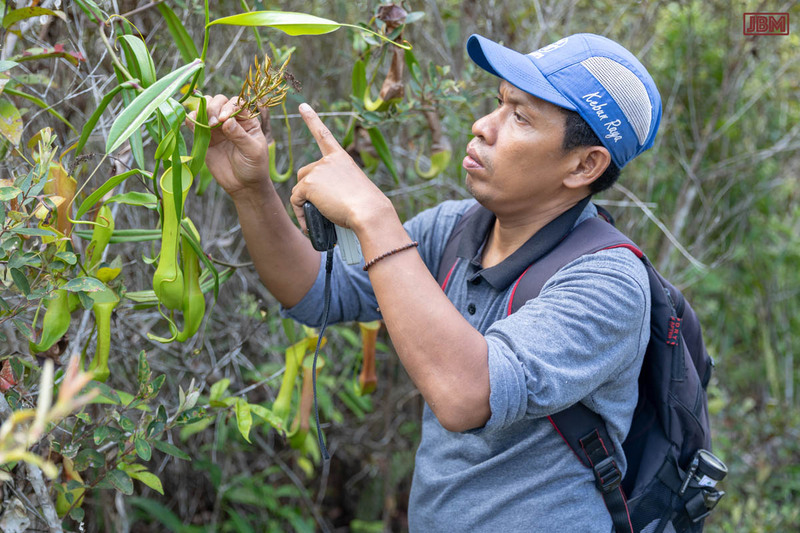 We were specifically looking for two species of pitcher plants (Nepenthes, locally called ‘kantong semar’). 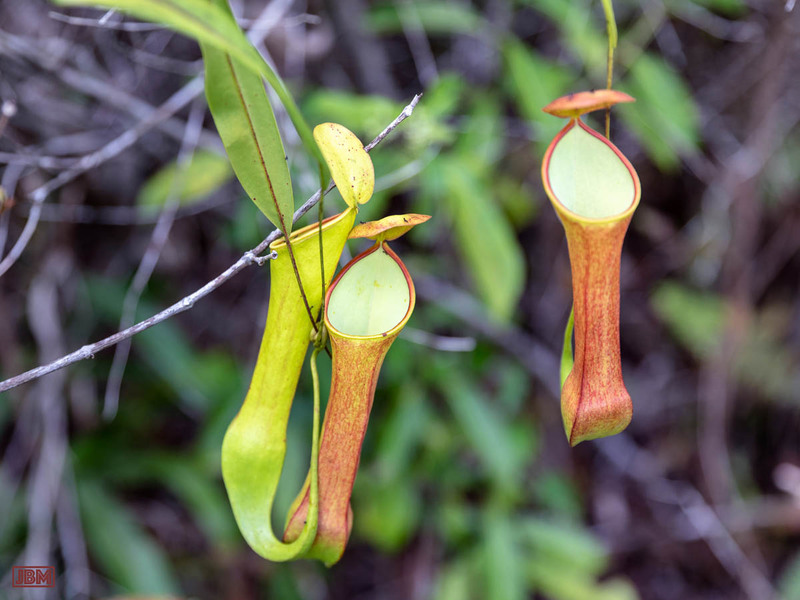 These wonderful plants overcome the lack of soil nutrients (especially nitrogen) by being carnivorous, attracting and consuming ants and other unfortunate little creatures in their sticky ‘pitchers’. The pitchers are actually formed as extensions to the plant’s leaves. 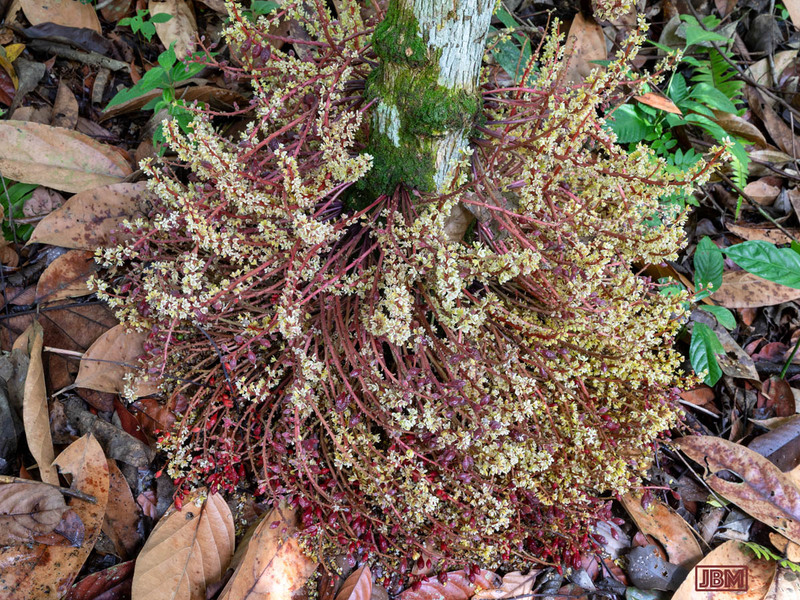 The Nepenthes flowers are located in clusters on separate stems of the plant. 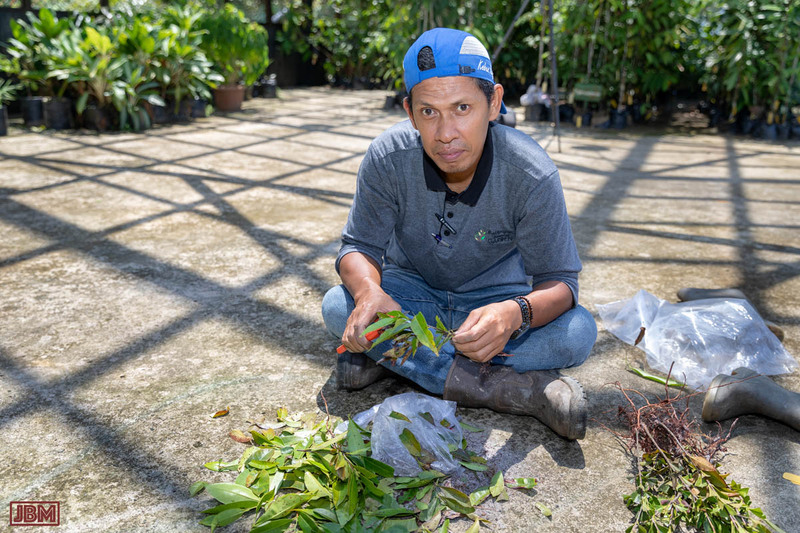 We collected two varieties: Nepenthes mirabilis and Nepenthes reinwardtiana. Each specimen was carefully extracted from the sandy soil. Then the roots and ball of soil were wrapped in plastic to keep moisture in, and to prevent damage. 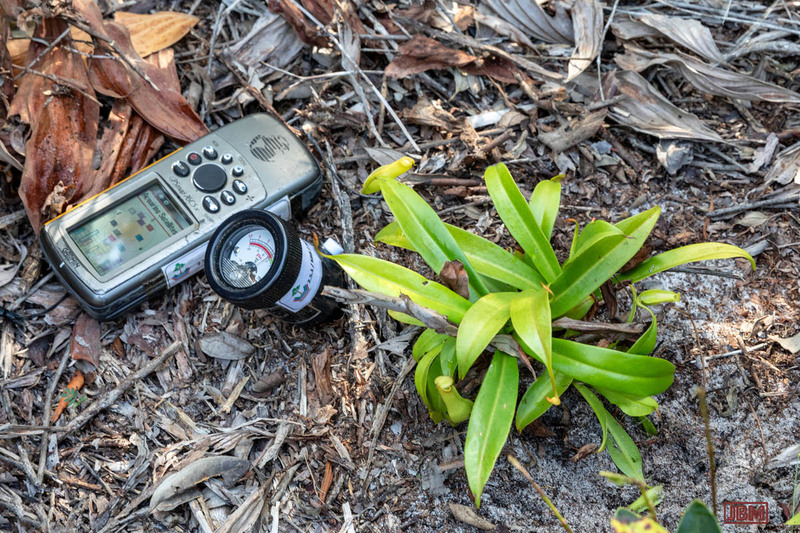 The soil acidity and moisture content were measured, and a GPS reading of the location and elevation was taken. All these details, along with a unique code for the collector and a unique identifier for the specimen, were carefully documented. 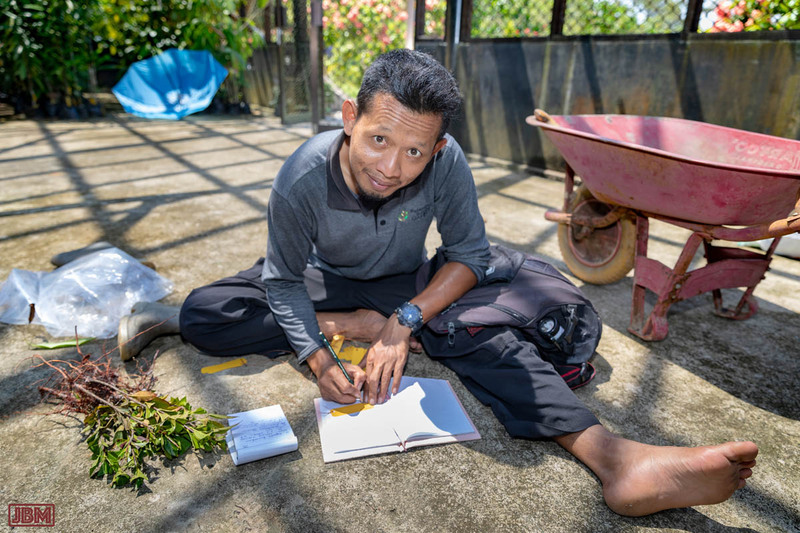 The unique identifier (known as a ‘nomor akses’) is used to keep track of the specimen when it is incorporated in the nursery at the Kebun Raya, and throughout its life after it is planted out into the ‘formal’ collections of the gardens. 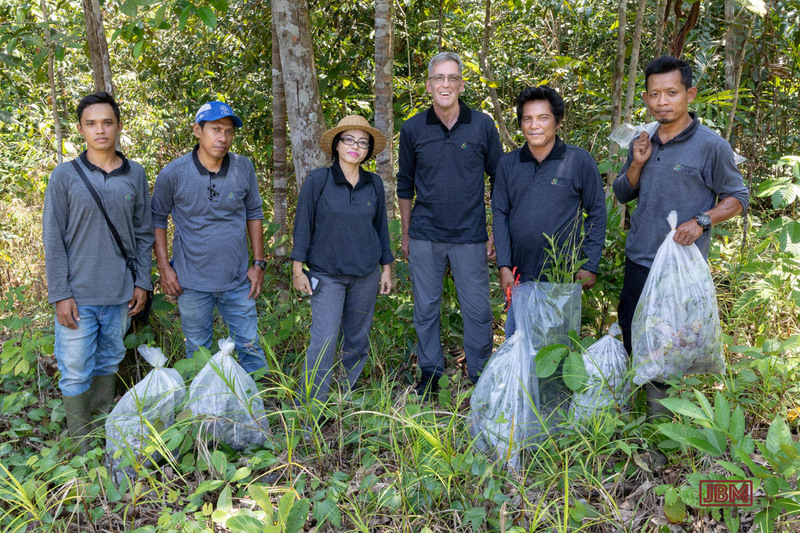 The plants were then placed in larger plastic bags which were sealed, again to limit water loss before returning to the Kebun Raya. 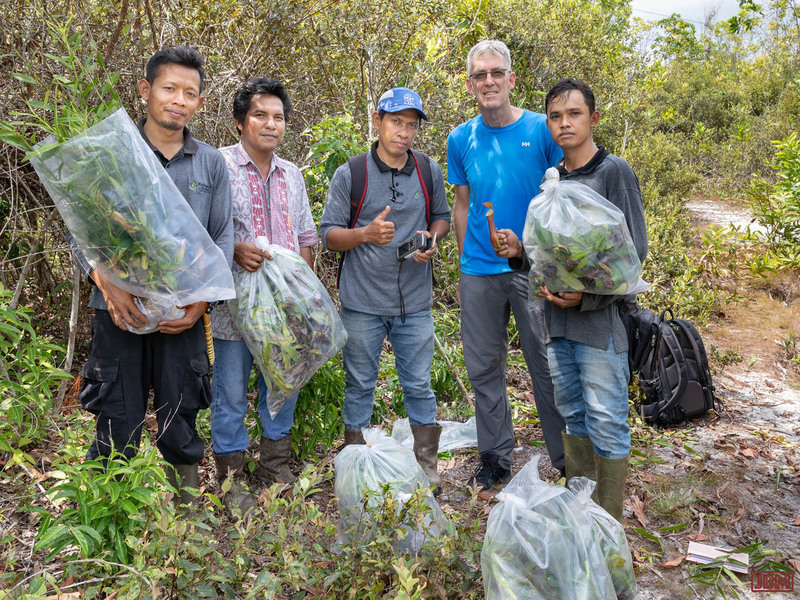 As well as Nepenthes, we collected specimens of a ground orchid (Bromheadia finlaysoniana), and a species of the shrub Tristianopsis. Job done, all packed up and ready to return. 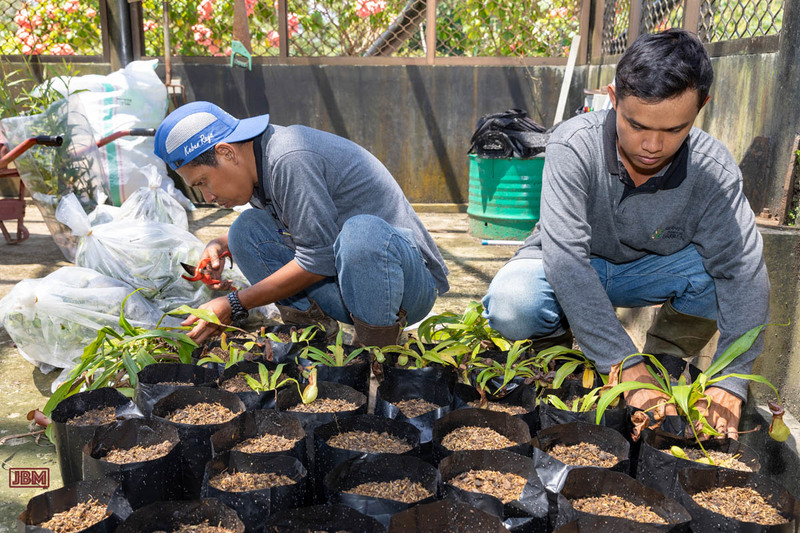 Back at the Kebun Raya, black polybags had already been prepared in the nursery. Each contained equal proportions of soil, rice husks and aged manure. 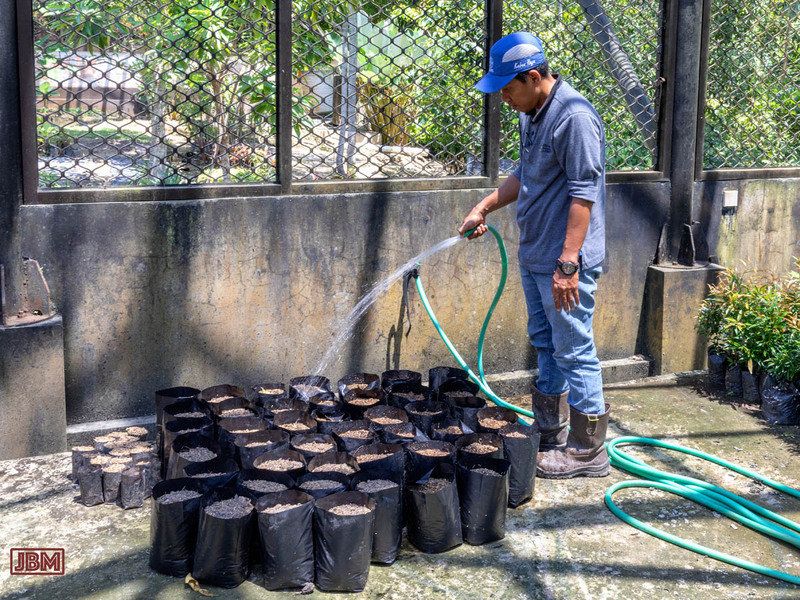 They were thoroughly moistened prior to planting the new specimens. 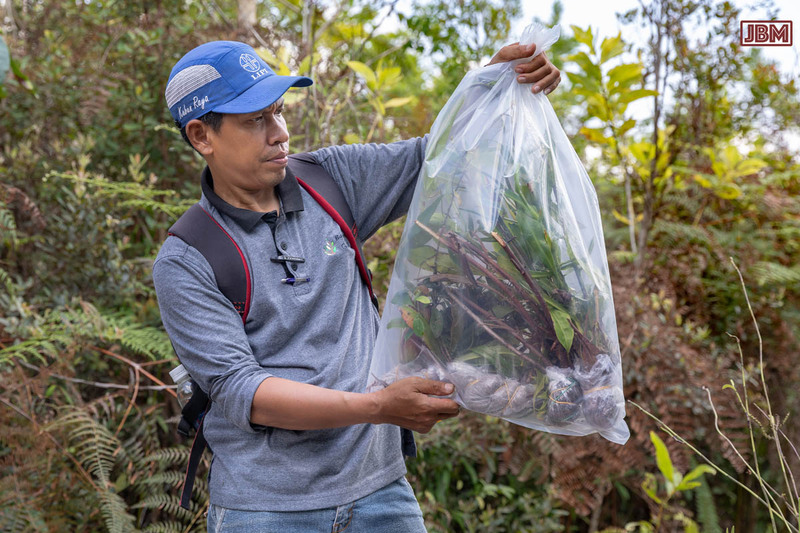 The specimens were removed from their collection bags, and excess foliage was trimmed to reduce transpiration while the plants get established in their new homes. Each was then carefully planted into a black polybag. Details from the field notebooks were transcribed onto forms, ready for input into the collection database. 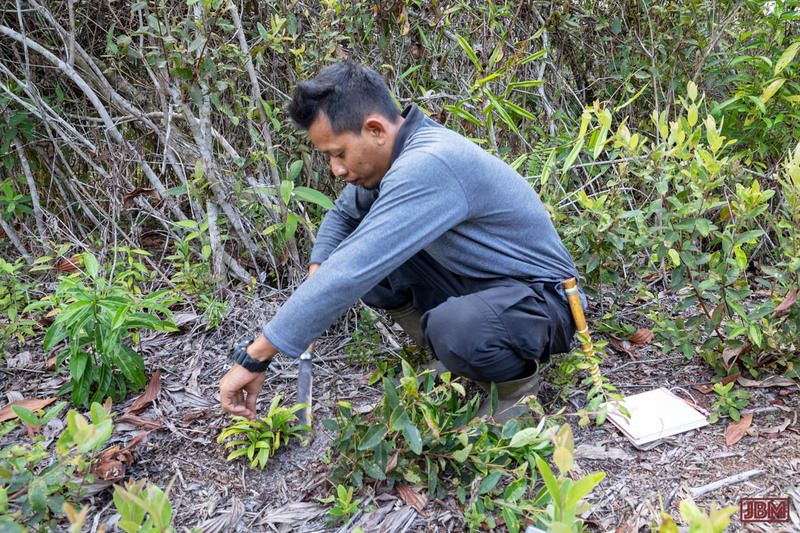 Yellow ID tags were prepared and attached to the plant specimens, which are now ‘formally’ part of the collection of the Kebun Raya Balikpapan. 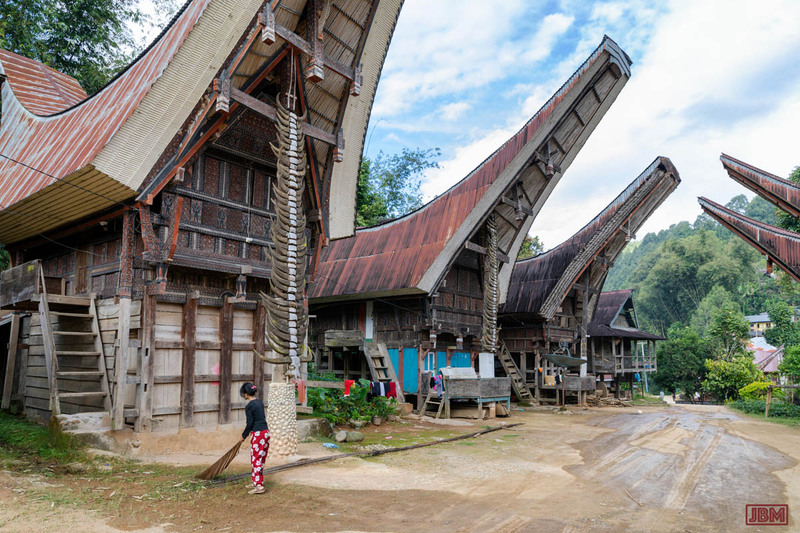 The traditional ancestral house in Toraja, South Sulawesi, is known as a tongkonan. 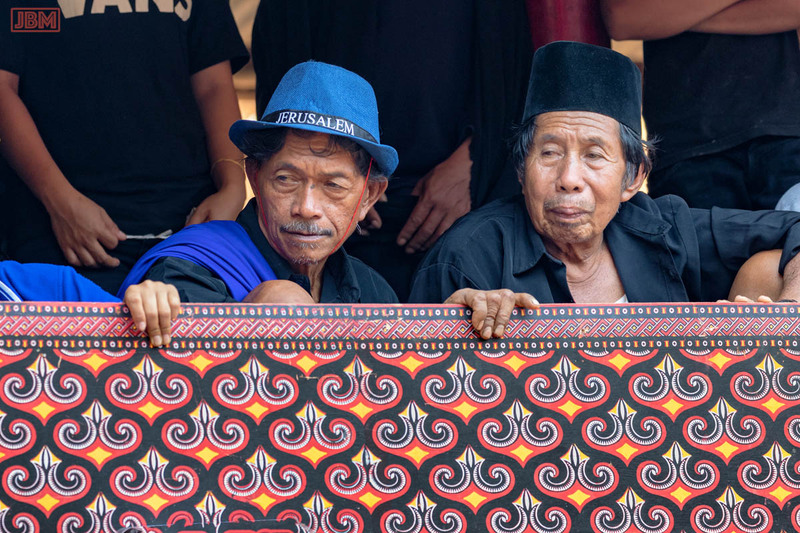 The name means ‘a place to sit’, because the tongkonan is the place where family and broader community members gather and meet. 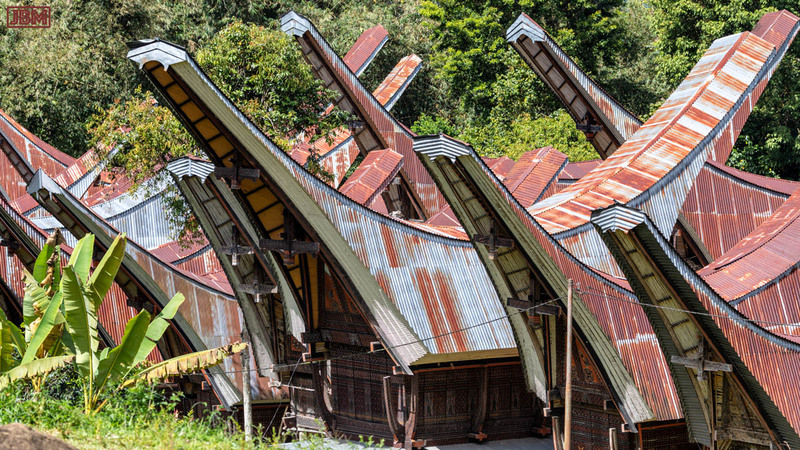 Unlike a lot of vernacular architecture around the world (such as the longhouses of nearby Kalimantan), these remarkable ‘saddleback’ buildings are not disappearing from the countryside. 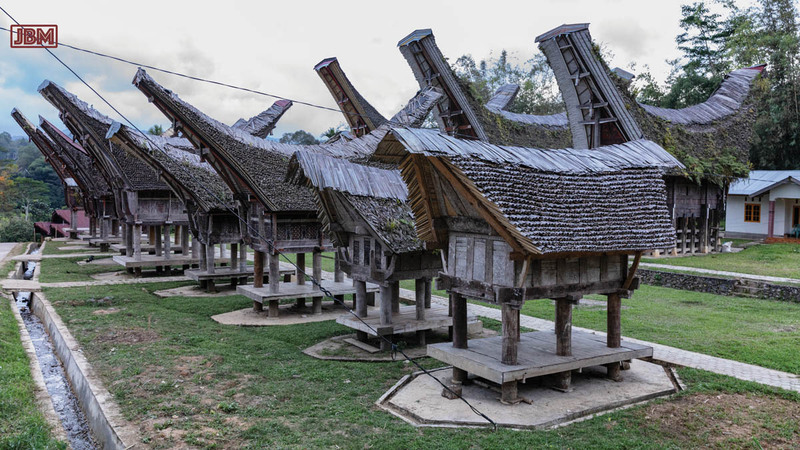 On the contrary, the large tongkonan, along with the smaller but very similar-designed rice-barns (known as alang) are seen dotting the landscape almost everywhere. And new ones continue to be built, too. 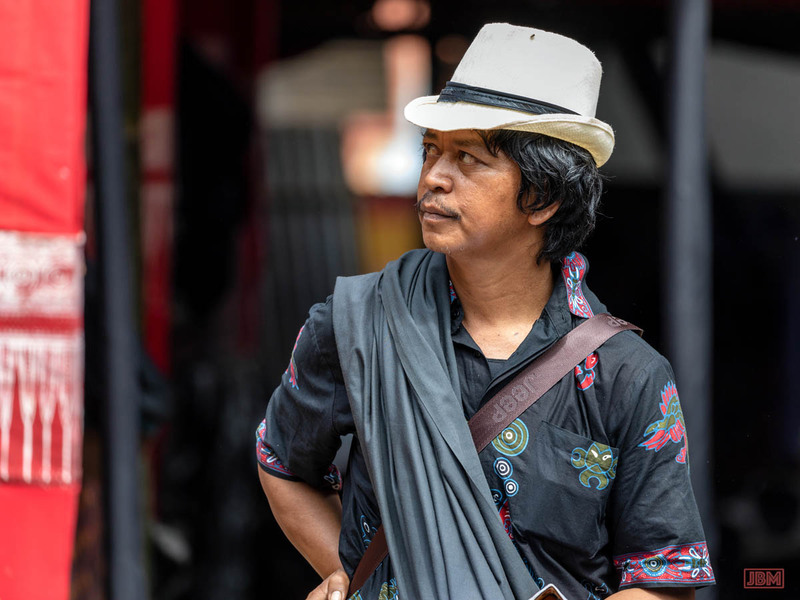 They have undergone a resurgence in cultural significance, both as iconic symbols for the region’s tourism industry, and more importantly as a powerfully distinctive symbol of Torajan cultural identity. 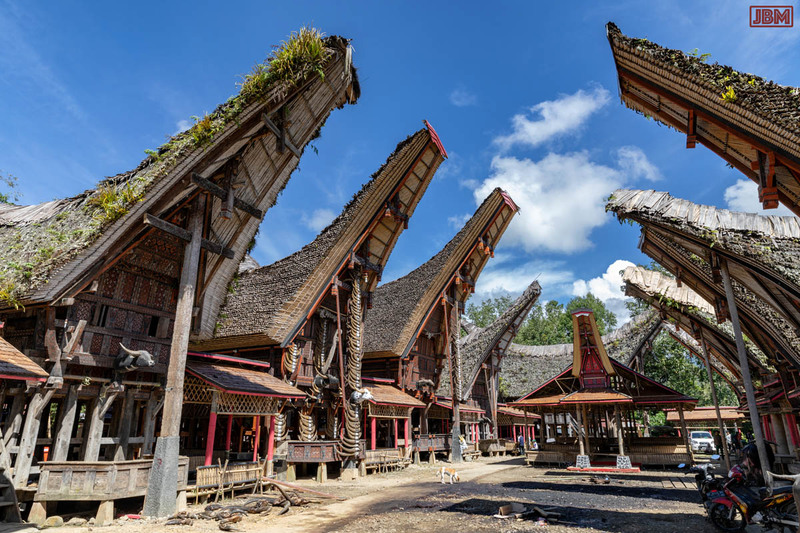 We slept a couple of nights in the tongkonan on the left in the picture below (in desa Sa’dan Ulusalu). 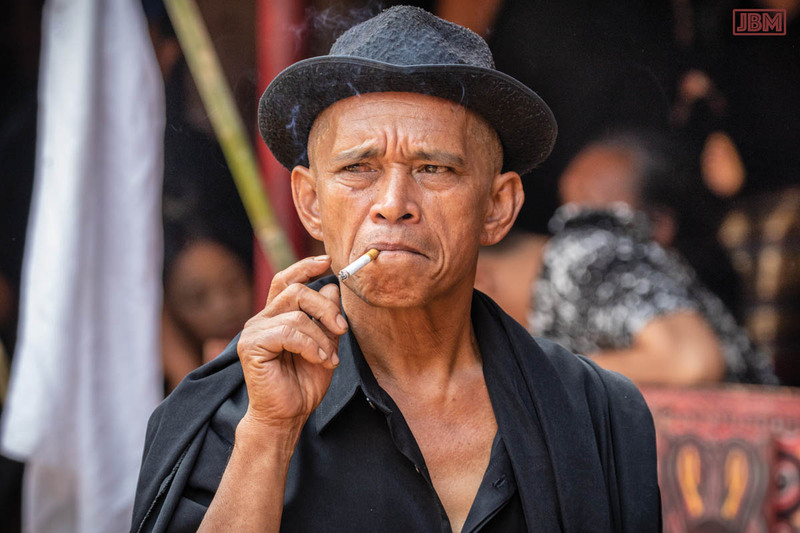 In the 1950’s and 60’s the central government had sought to suppress the construction and use of tongkonan which they viewed as ‘backward’ and ‘primitive’. 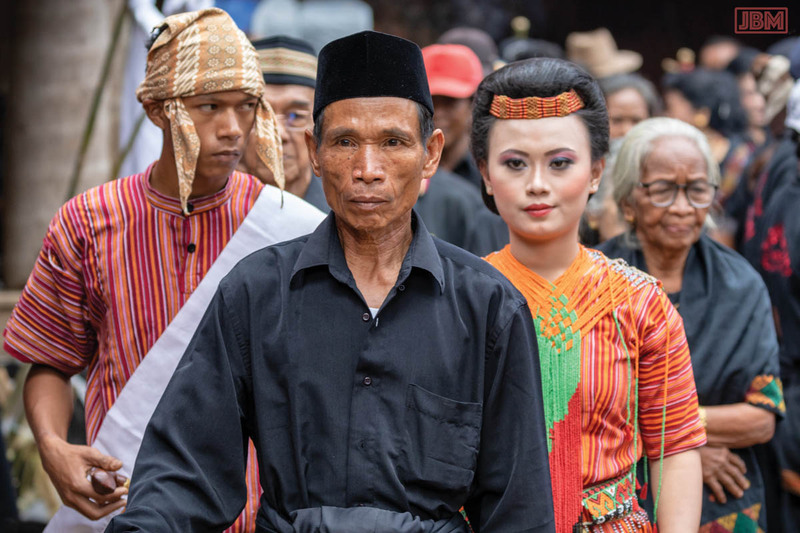 However they have since come to see their value for tourism, and as a ‘safe’ token of ethnic diversity in Indonesia. 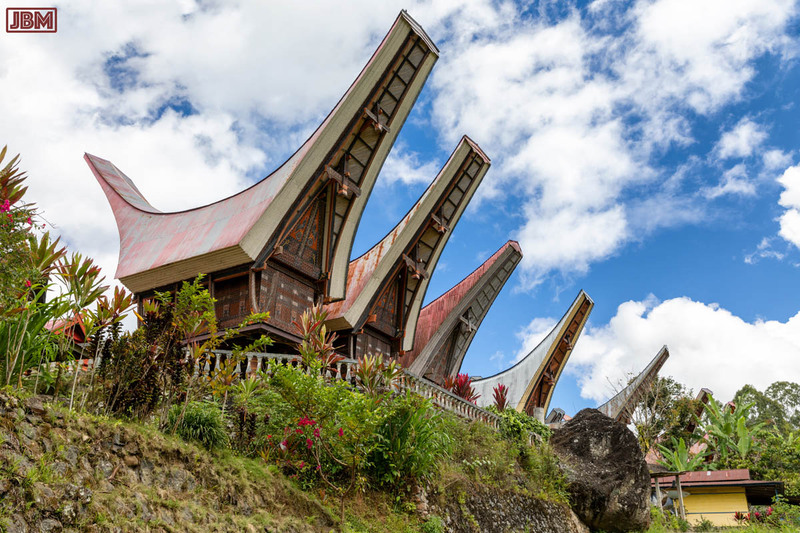 Other public buildings, businesses and even churches are now often built to reflect the traditional form of a tongkonan. 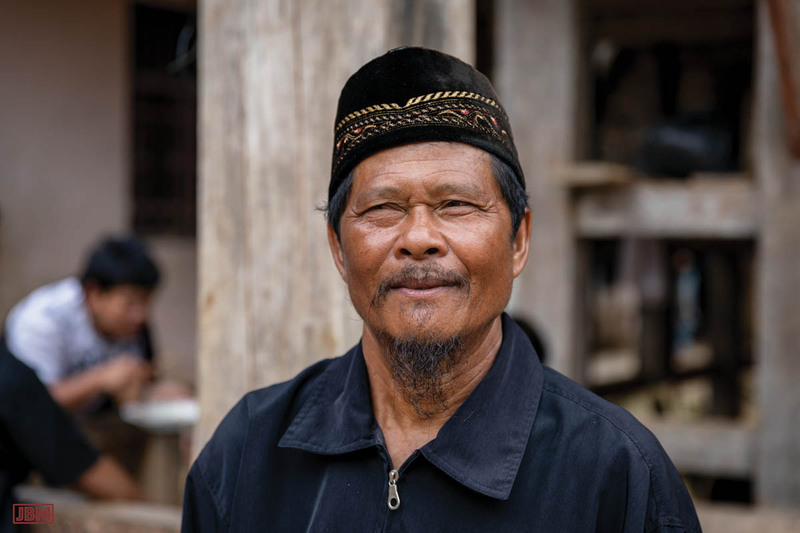 In times past, only families of the nobility were permitted to construct a tongkonan, but that rule is nowadays relaxed. 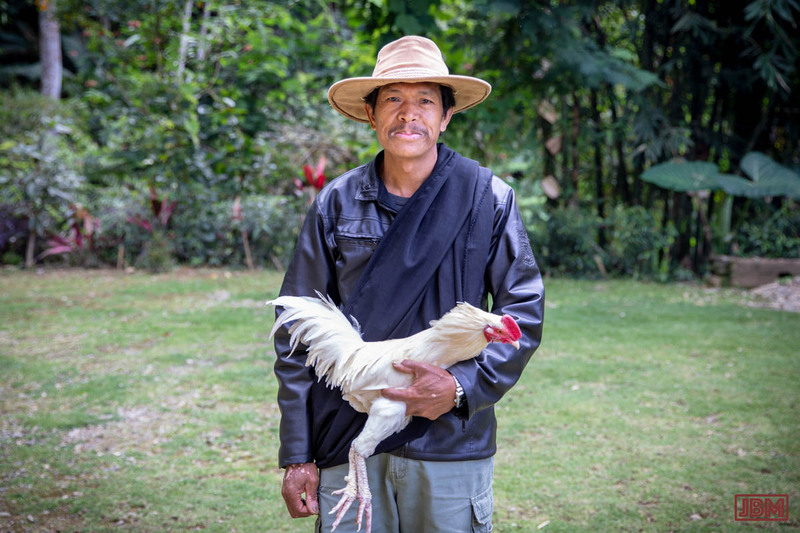 This is in part due to the diaspora of Torajans across Indonesia, sending remittances home to their families. 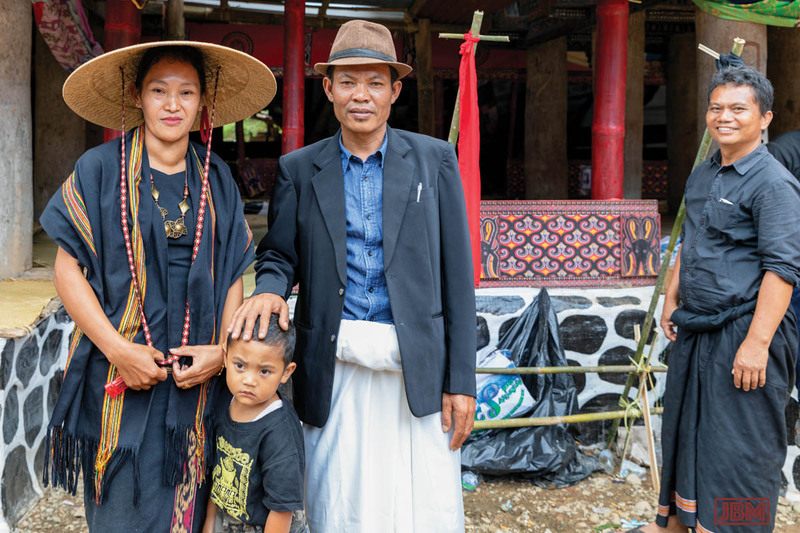 Families who may have been at the lower end of the social hierarchy now have enough money to build their own tongkonan. 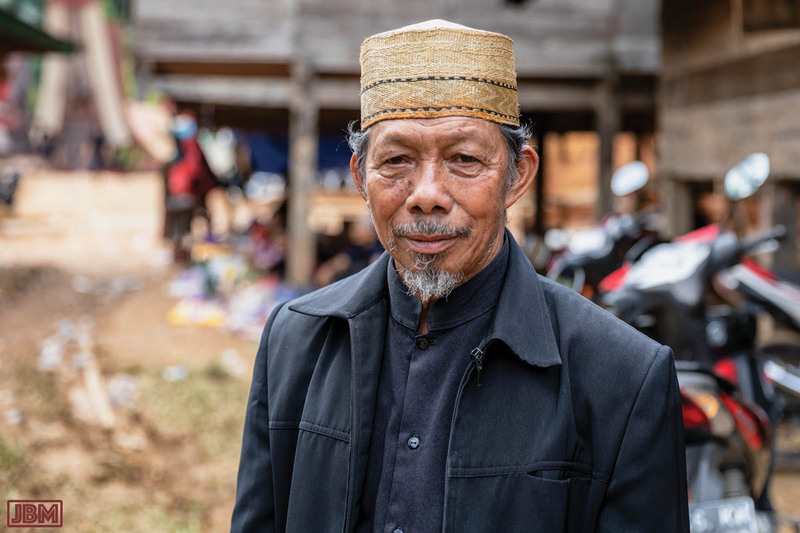 The change is also due to the powerful Torajan church wanting to break down the previously very hierarchical nature of society, and promote greater equality. 1. 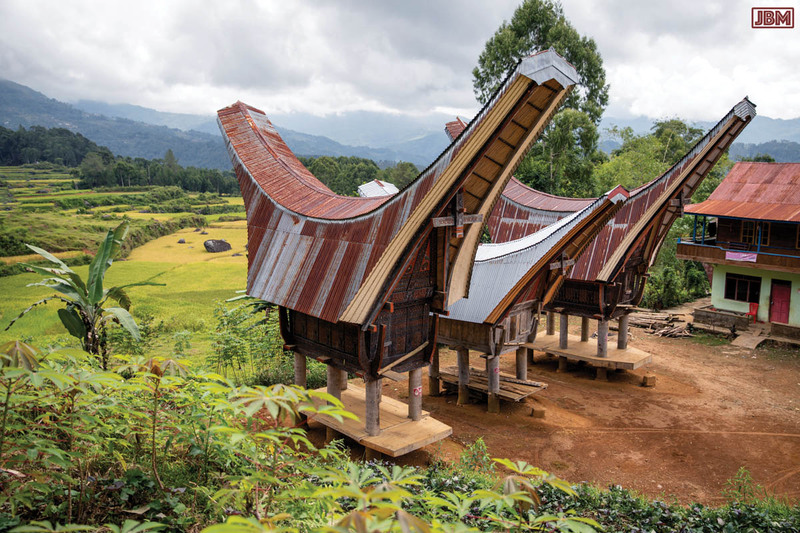 The first is that the people of Toraja came by boat from mainland Asia, and their boats were then used for shelter. 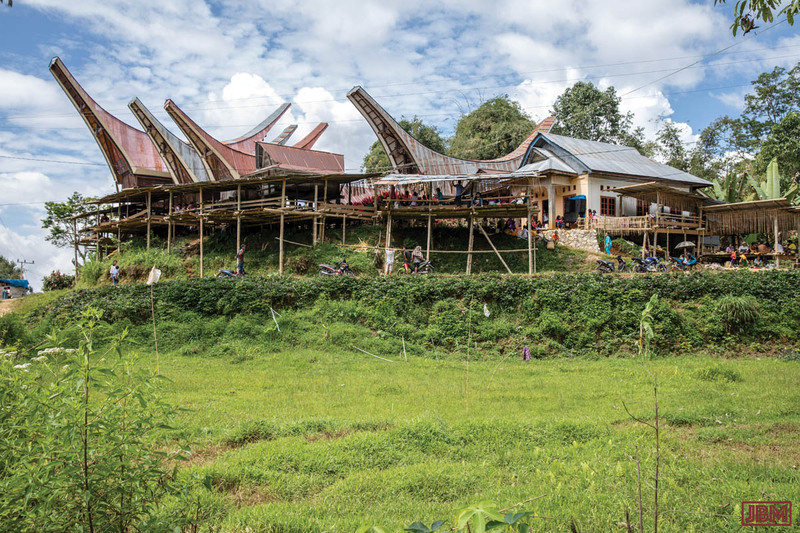 As new homes were constructed, they retained the boat-like form. 2. The second story is that the shape is that of a building in heaven, which was mimicked by the Torajan ancestors when they came down to earth. 3. 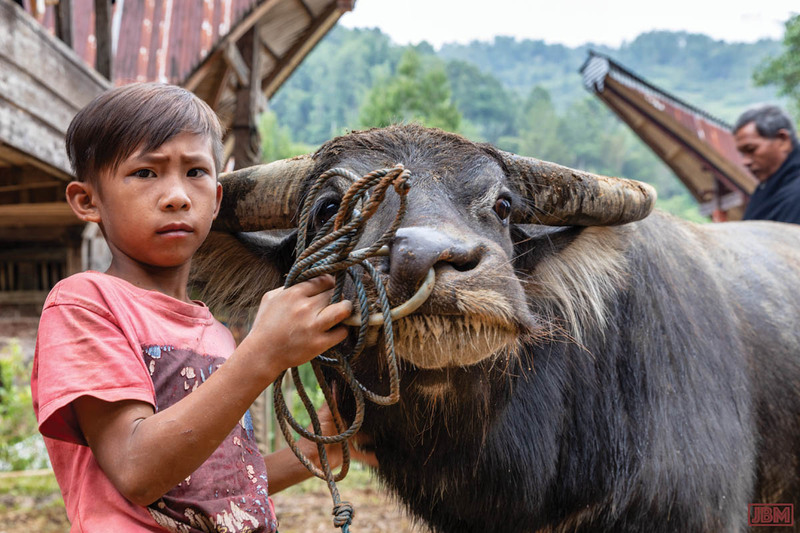 The third explanation (which I rather like) is that the upswept roofline is intended to resemble the shape of buffalo horns – as buffalo (kerbau) are very significant and deeply symbolic in Torajan culture. Both tongkonan and alang are always aligned along a north-south axis, with the tongkonan facing northwards and the alang opposite and facing south. They form two neat rows when built en masse. 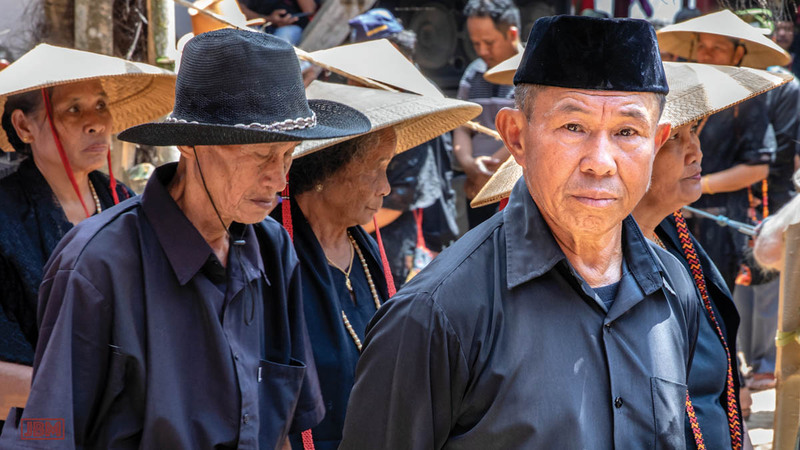 They stand on piles, so with the vaulted roof on top, they contain three distinct levels – symbolic of the three levels of the universe in Torajan cosmology. The attic level is where family heirlooms are housed. The living area is on the main level, accessed usually through a doorway at the north end of the east wall. 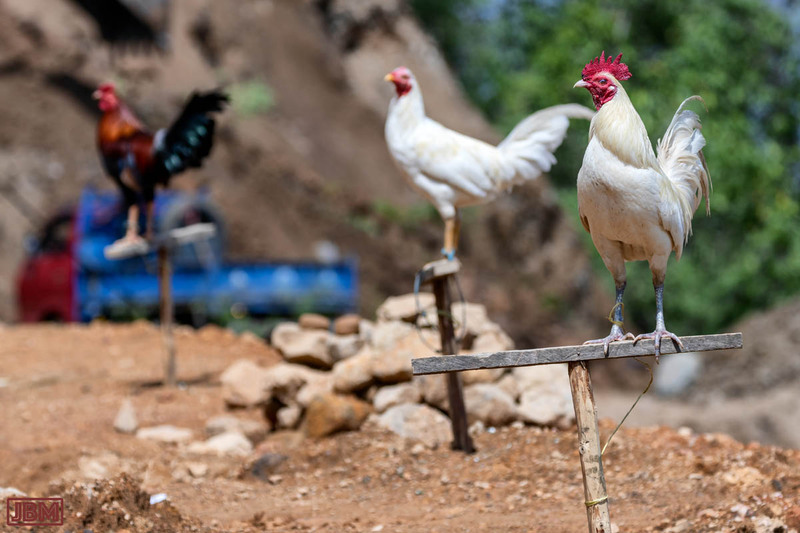 The area underneath may be partially or fully enclosed, and can be used to house domestic animals or for general storage. 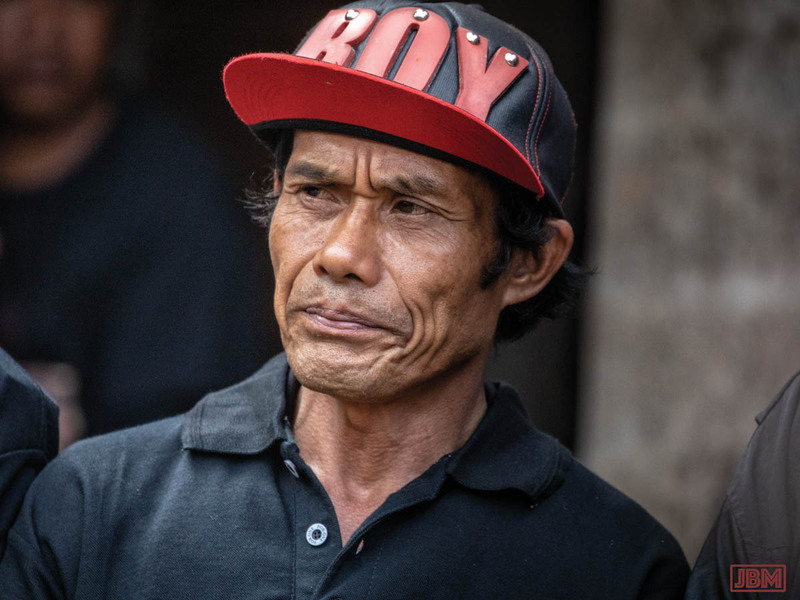 We were told that the construction of tongkonan is a very specialised skill, and that the builders/artisans who construct them all come from just a few villages in the region. That’s not difficult to believe, as the process appears to be both technically complex and perilous. 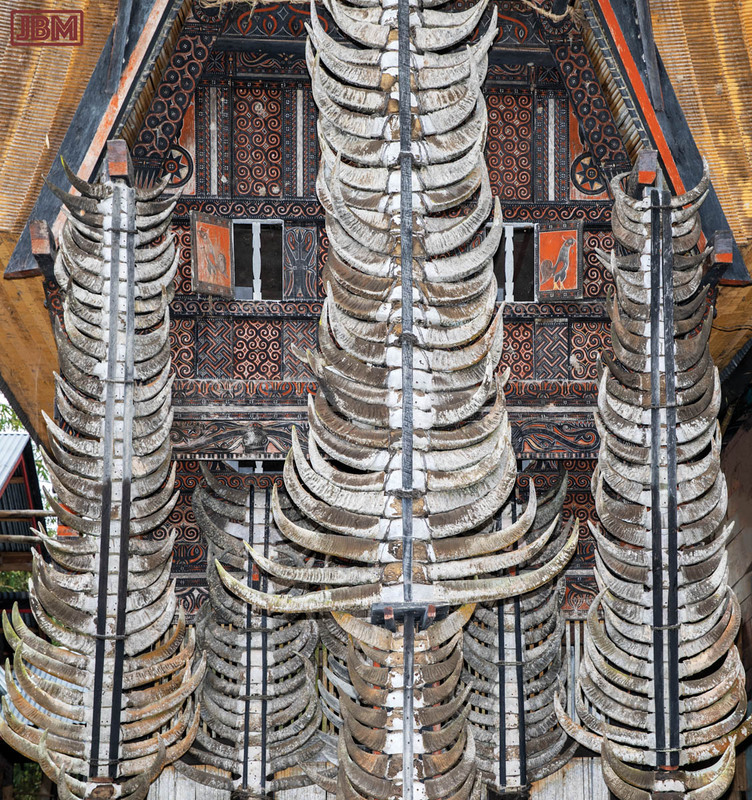 For instance, they were (and possibly still are) constructed without any use of nails or screws. 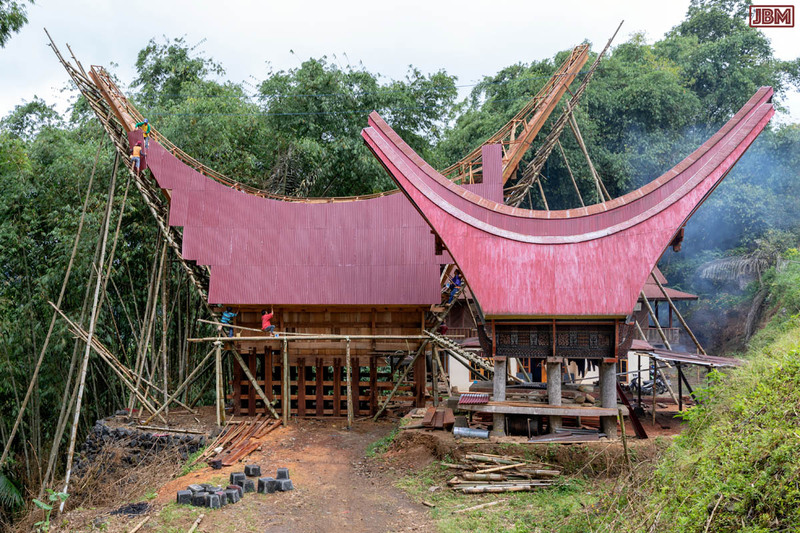 And just take a look at the very lengthy bamboo poles and scaffolding propping up the roof as it is being built – and the ‘protective footwear’ worn by the builders. 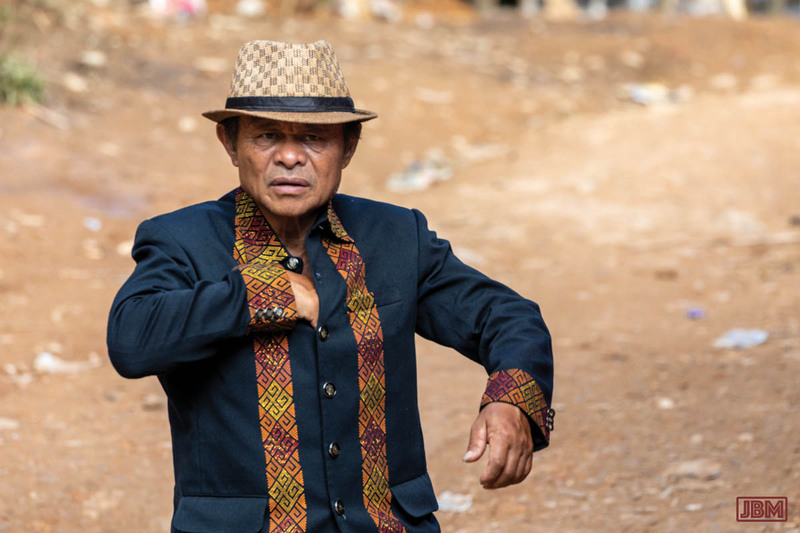 An average-sized tongkonan can cost around Rp700 million (a little under AU$7,000 at current exchange rates). 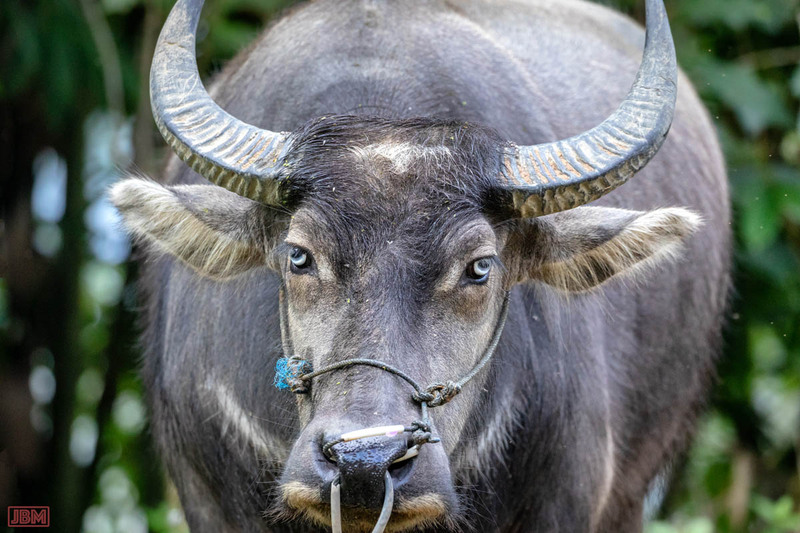 Given that one ‘very special’ buffalo (e.g. 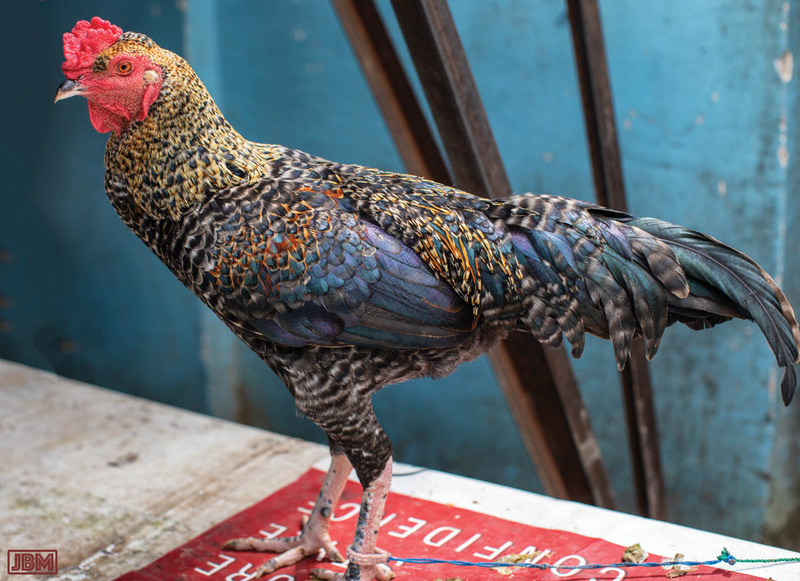 a blue-eyed albino with particular auspicious markings) can cost almost as much, the price of a new tongkonan seems quite reasonable. 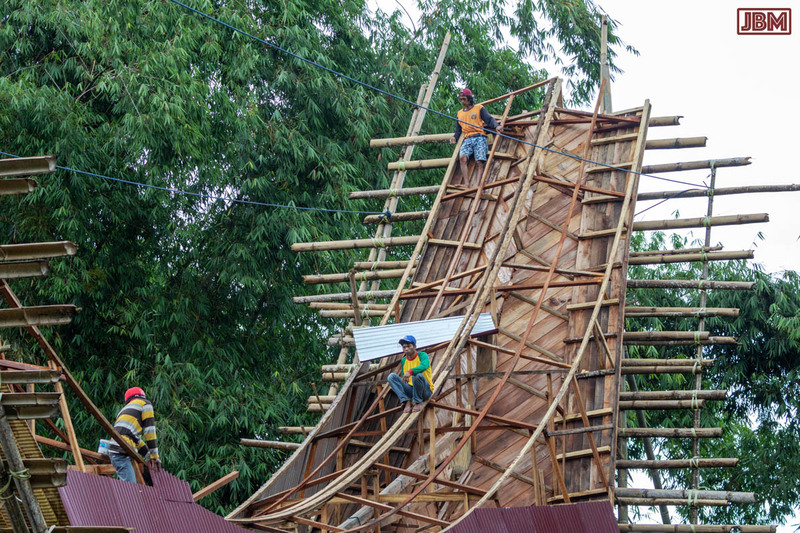 A team of ten will need about three months to build it, and a further month for the external carving and decorations. 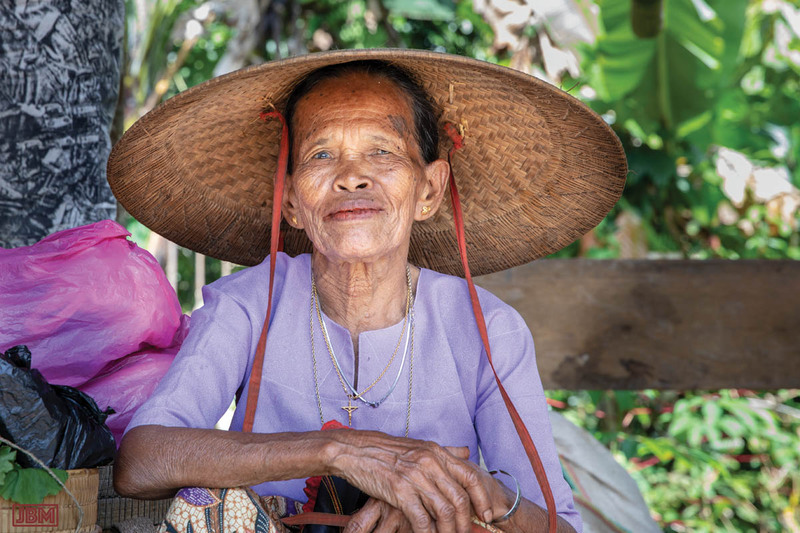 We attended a ceremony in the village of Patongko to inaugurate a newly constructed family tongkonan. 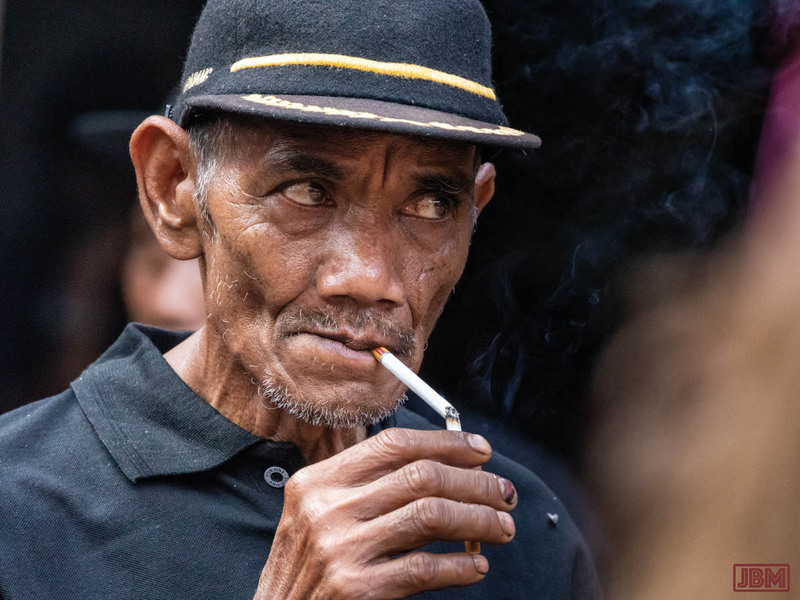 Like a Torajan funeral ceremony, this was a massive, multi-day affair, with hundreds of attendees, including family members who returned home from all over Indonesia for the occasion. 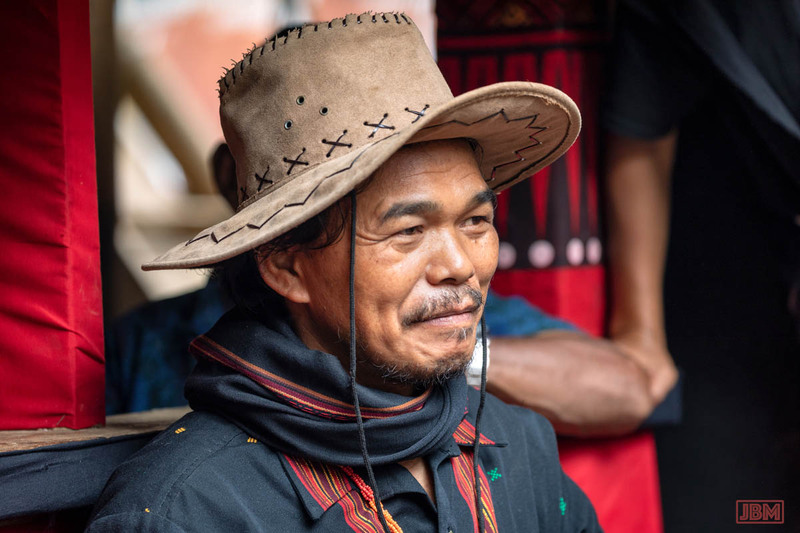 Active participation in ceremonies like this is essential for anyone wanting to maintain their connections to family and its tongkonan, and their place within the family. 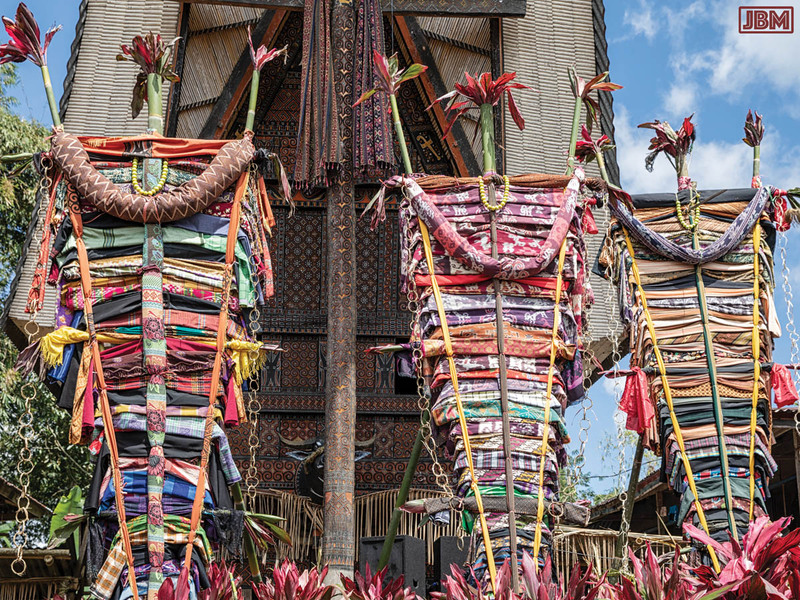 At the front of the new tongkonan were three bamboo frames decorated with masses of fine textiles and cordyline leaves. 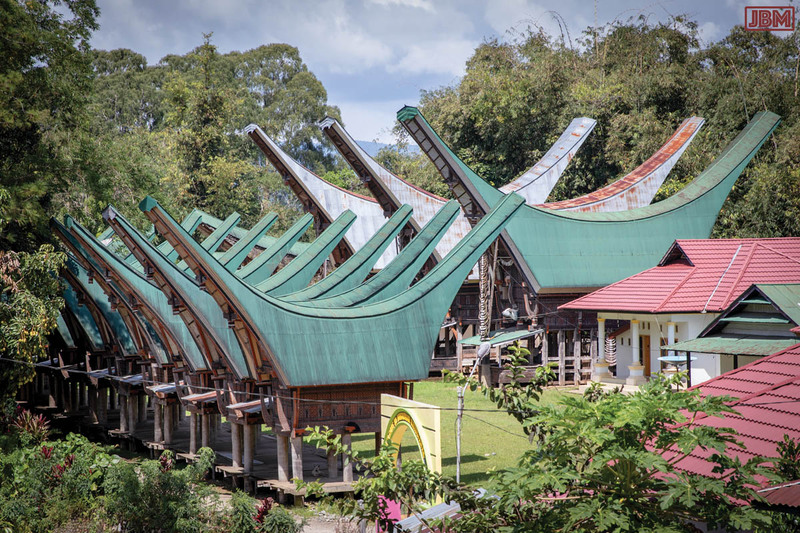 As with funerals, a number of temporary buildings and shelters were specially constructed using bamboo for the formwork. 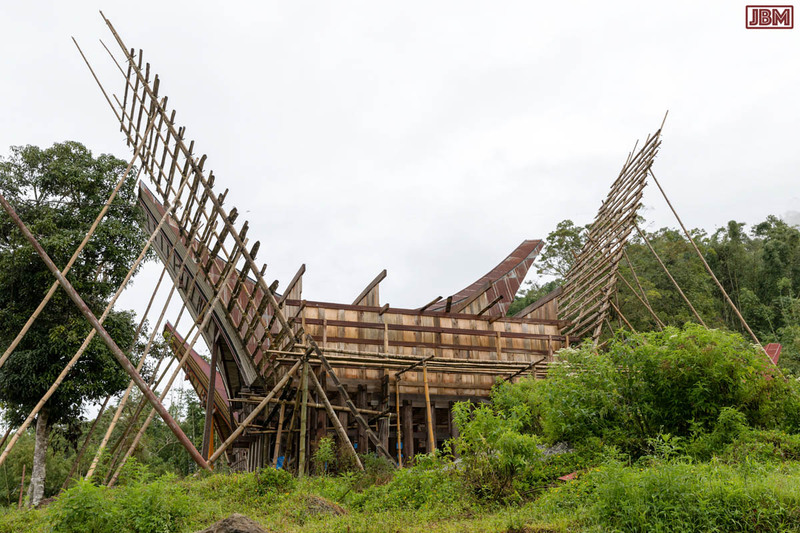 After the ceremony, all these constructions were to be demolished and burnt or re-purposed. There were also a large number of animals sacrificed at the ceremony. 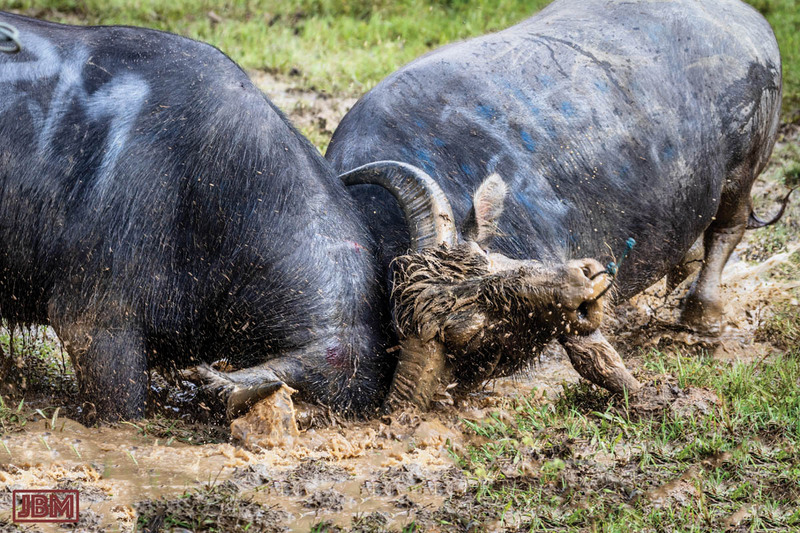 As wells buffalo, there were some 98 pigs, mostly donated by family, friends and neighbours. 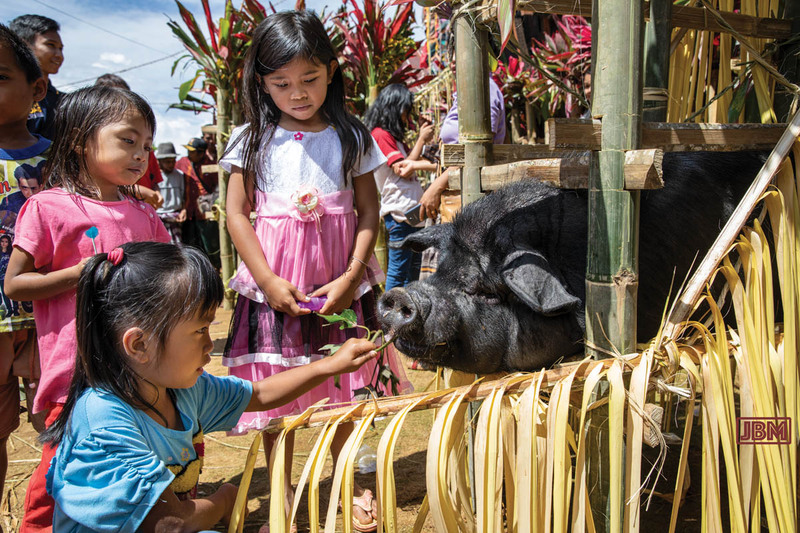 Ahead of their terminal contribution to the proceedings, the condemned pigs were housed and displayed in bamboo enclosures, arranged around the new tongkonan. Children brought them water and leafy snacks to ease their discomfort. The external walls are usually (but not always) ornamented with carved designs, hand-painted in red, black, yellow and white. 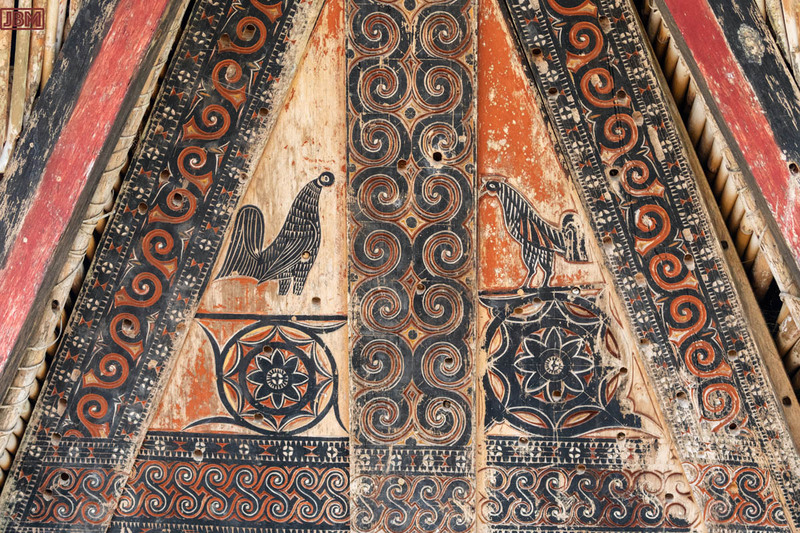 Motifs represent the sun and moon, buffalo, buffalo horn, roosters, and a knot or basket design. 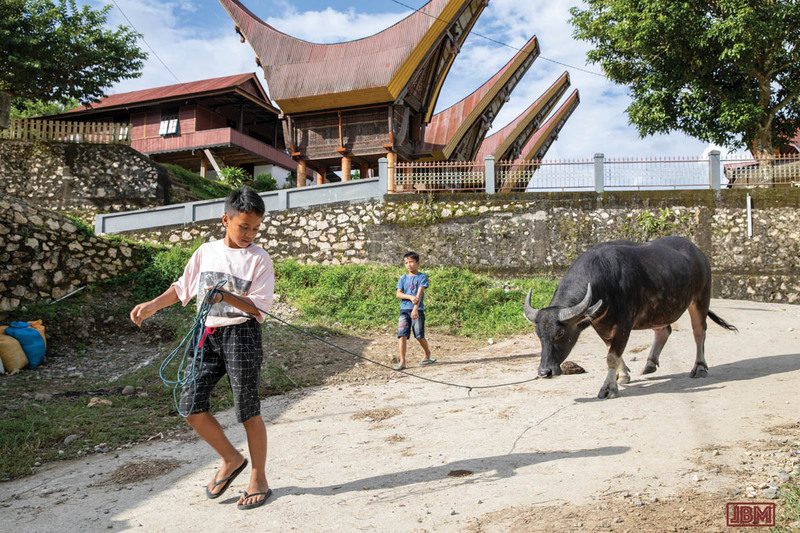 The front (north-facing) end of the tongkonan (but not the alang rice-barn) is usually adorned with a stacked array of buffalo horns. 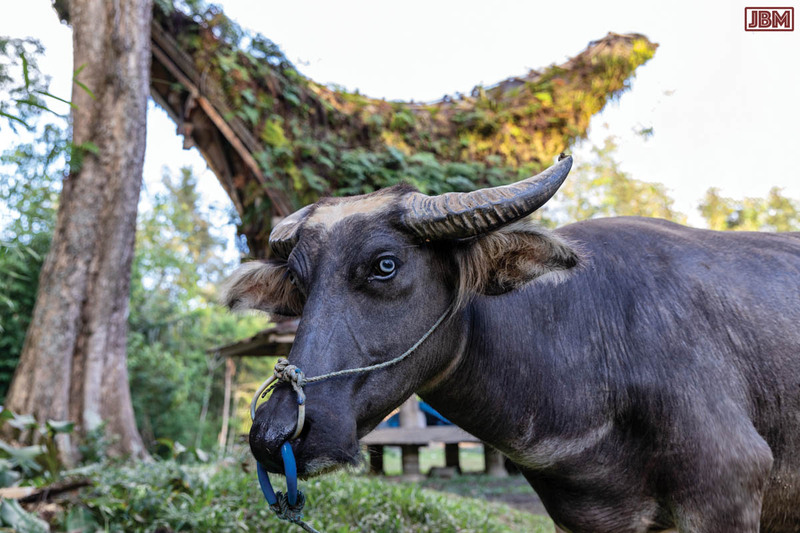 Collected from buffalo sacrificed for funerals and other ceremonial/ritual occasions, they symbolise prosperity and strength. 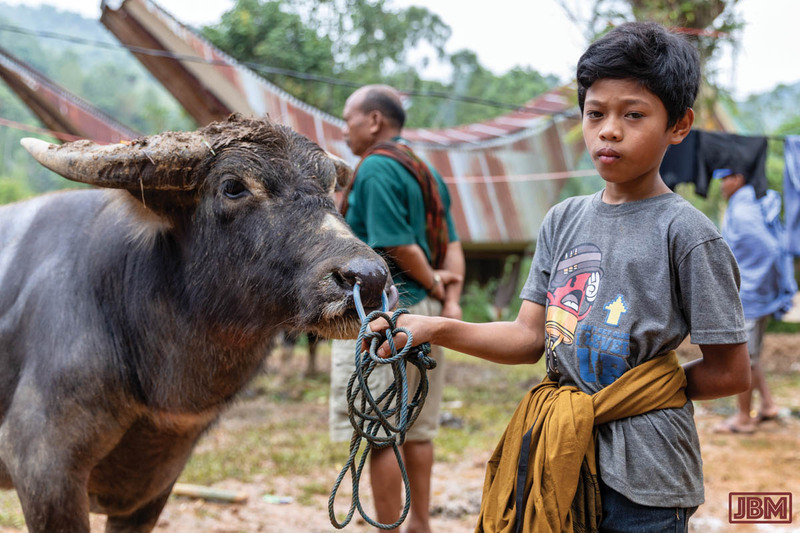 Considering the often exorbitant price of buffalo in Toraja, an array like this is certainly an indicator of considerable wealth! 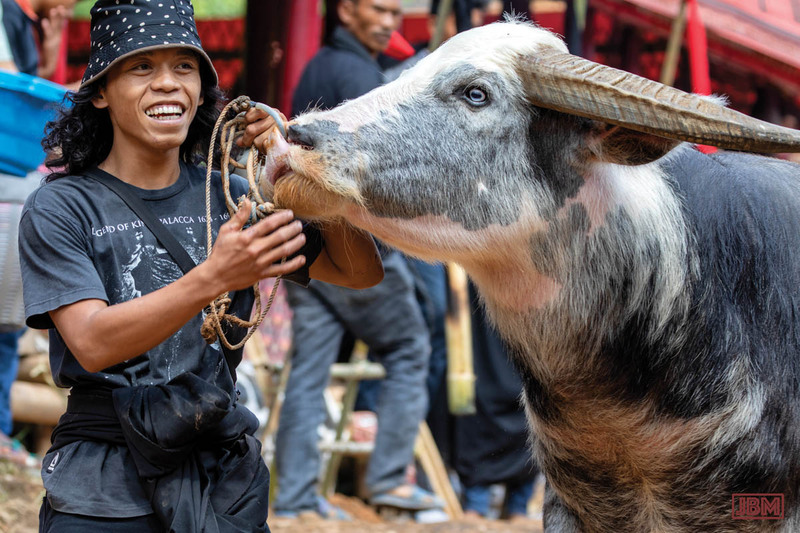 Hats off to Toraja! 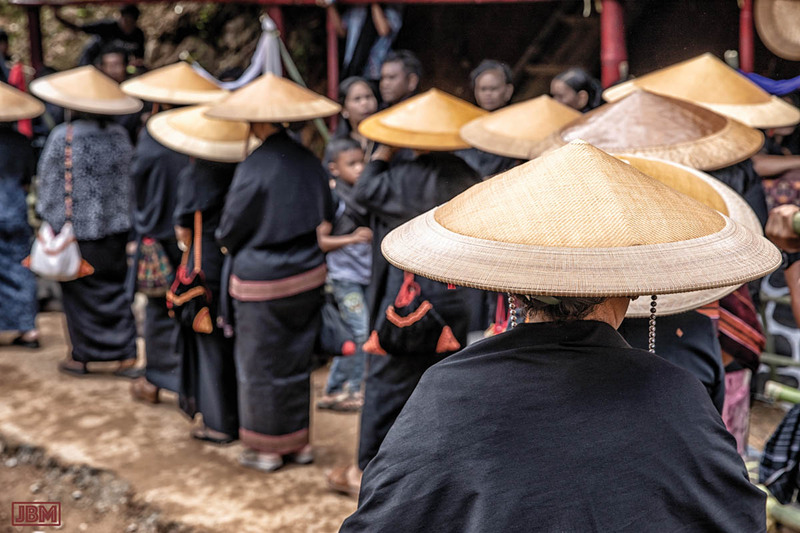 Celebrating some of the diversity of headwear on show in this very special part of Sulawesi. These faces exude great depth of character, so no further adornment or comment is needed. 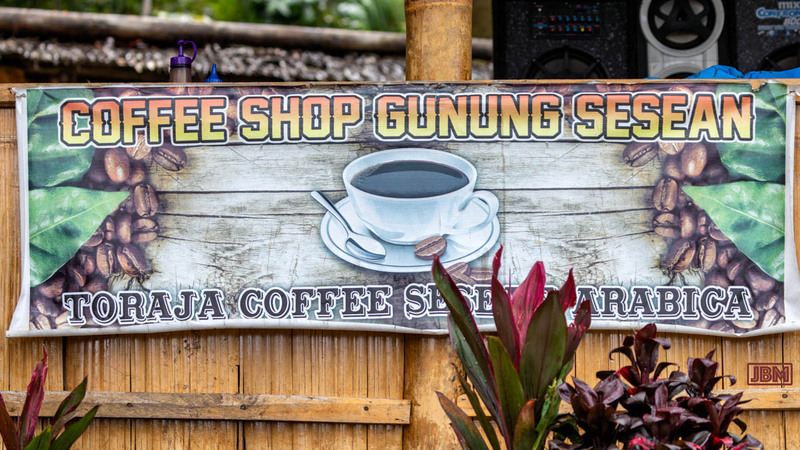 Coffee was first brought to Indonesia by the Dutch around 1700, and now Indonesia is the world’s fourth-largest coffee producer. 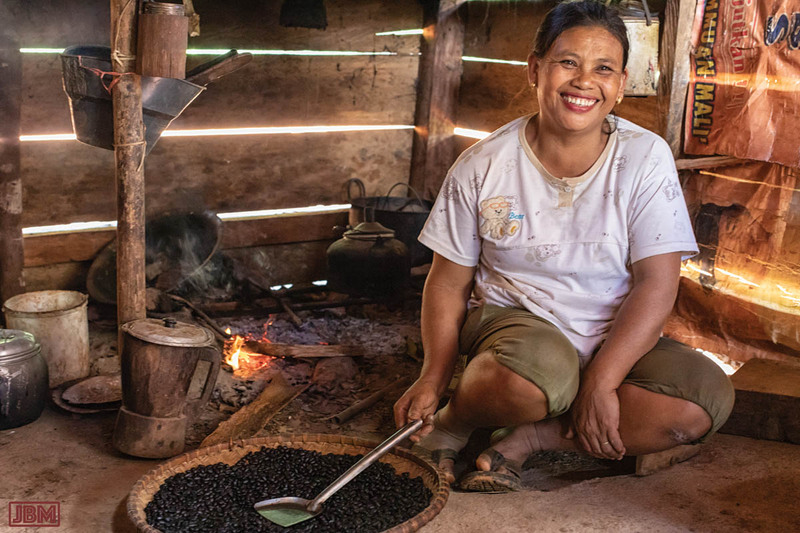 Since we first arrived in Indonesia in 2009, we’ve enjoyed a range of distinctive regional coffees – from Bali, Papua, Java, Sumatra, and – especially – from the highland region of Toraja in South Sulawesi. 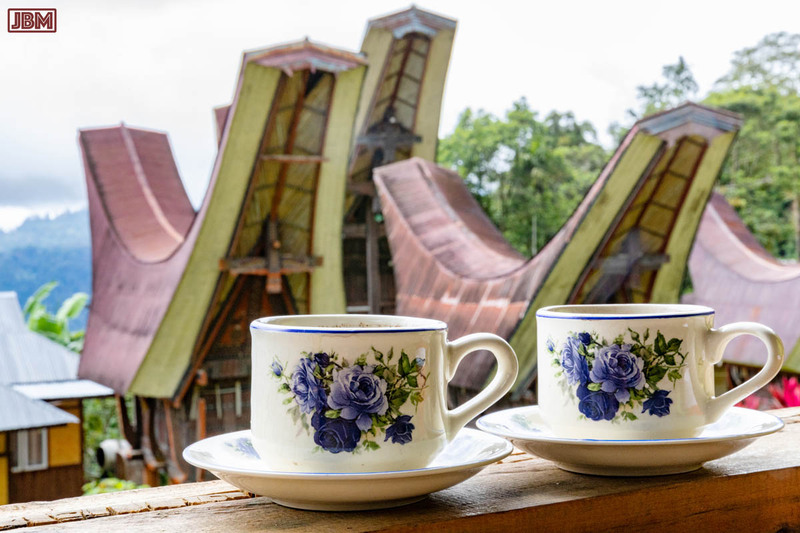 Toraja coffee is special in several ways. 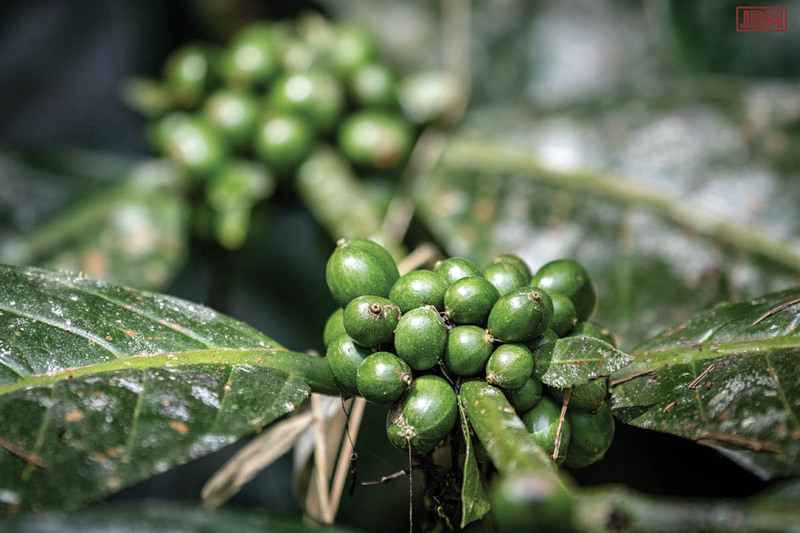 It’s almost all of the Arabica variety, whereas the majority of Indonesian coffee is Robusta. 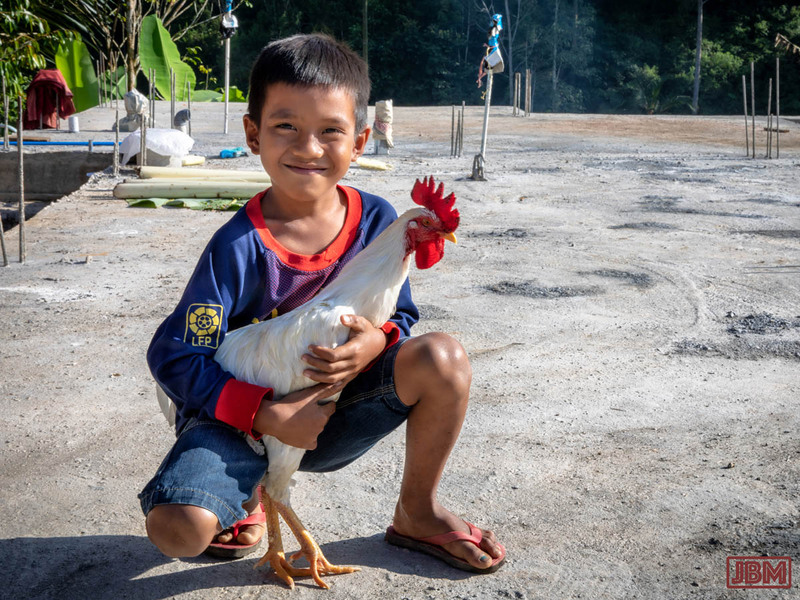 95% of it is produced by smallholders rather than on commercial plantations. 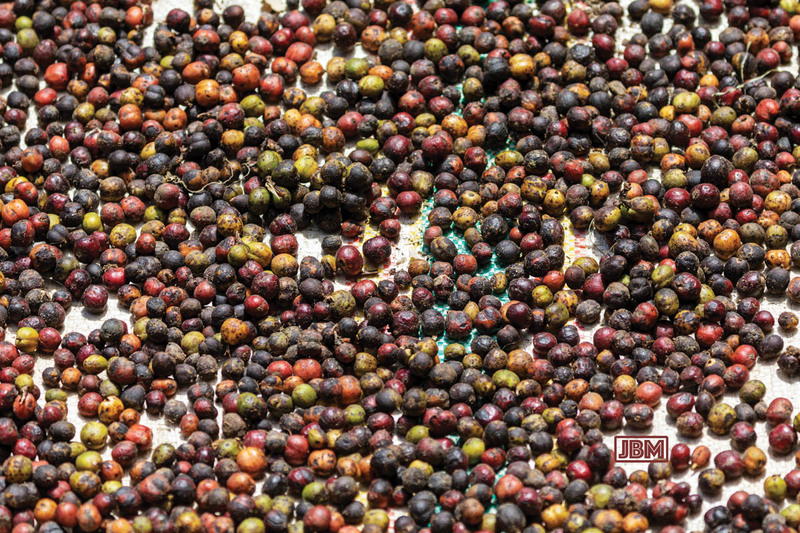 And the harvested fruit is processed differently – often just dry-processed, or using the “giling basah” technique (‘wet hulling’). Both techniques are much quicker and simpler than the standard ‘wet processing method (great detailed explanation here). 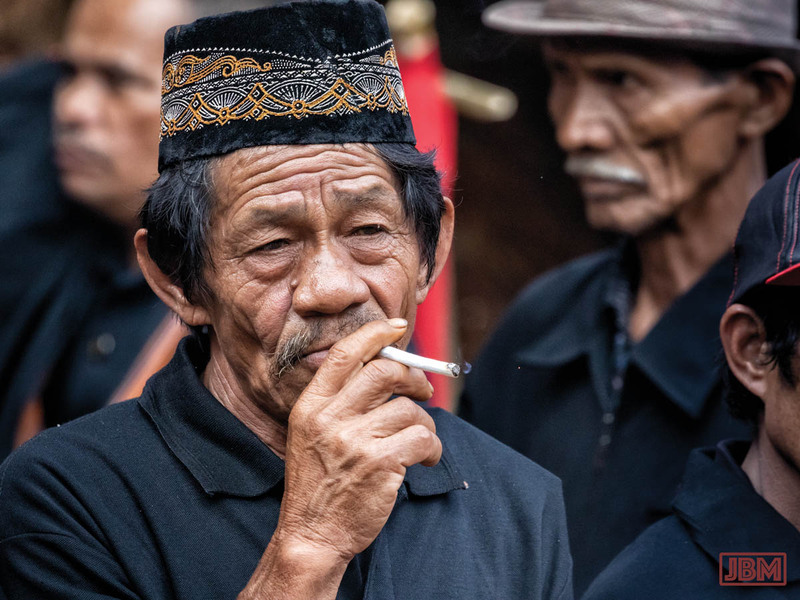 There’s been coffee grown in Toraja since about 1850, and production has really accelerated over the past 30 years or so. 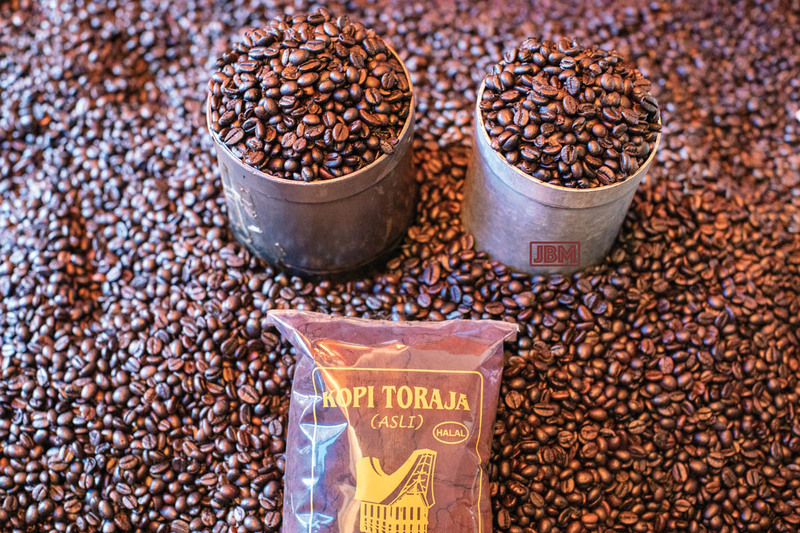 Coffee buffs describe Toraja coffee as having a smooth, full-bodied caramel flavour, spicy overtones (cinnamon, cardamom and black pepper) and a soft clean aftertaste. Whatever… it tastes good. 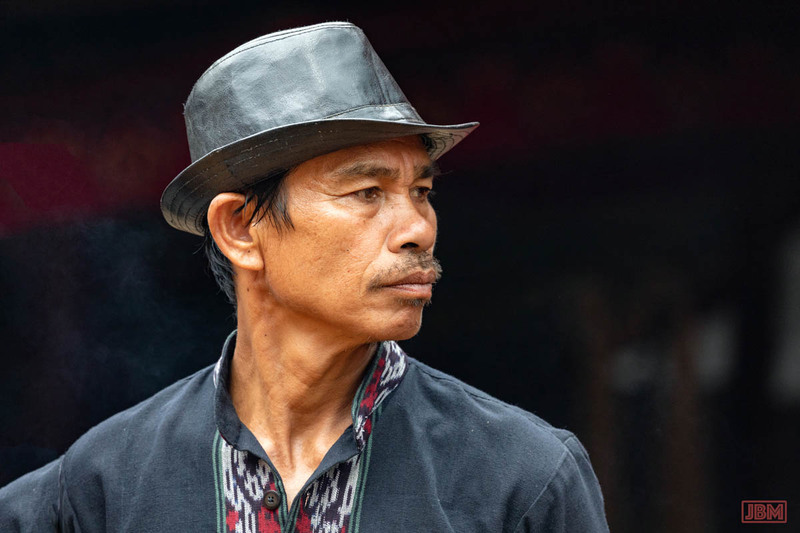 We had the opportunity to get a closer look at coffee production while we were trekking and touring around North Toraja last month. Coffee could be seen growing beside the trails and roads just about everywhere we went. 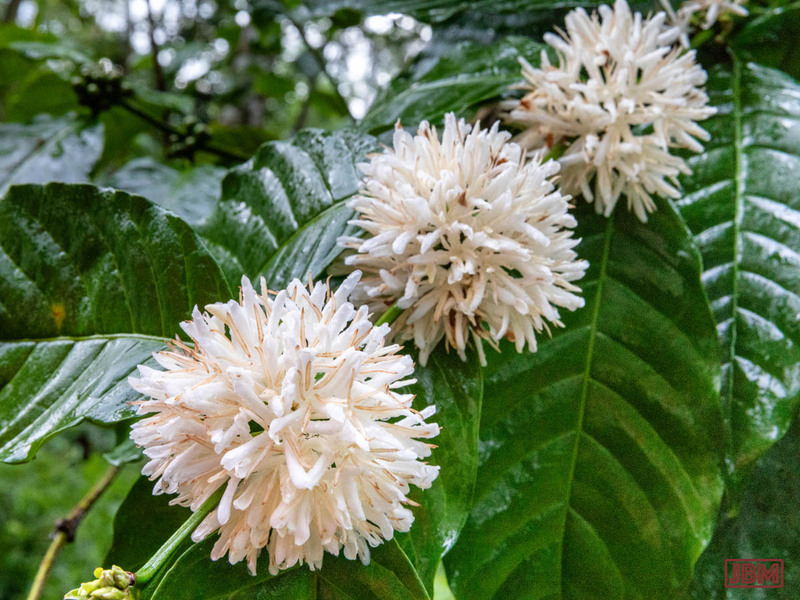 The first really surprising thing for us was the flowers, as we had no idea that coffee flowers are so pretty, or that they have a powerful sweet smell, almost like jasmine. 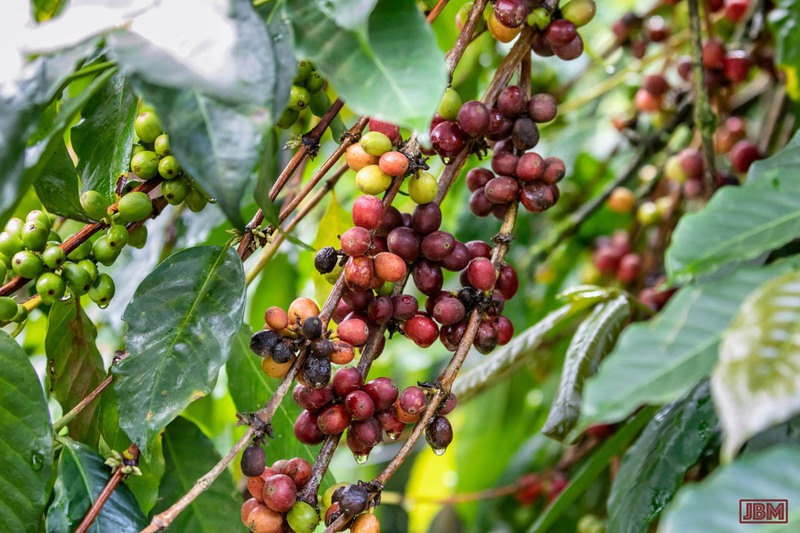 The flowers only last a couple of days, and it’s not long before green berries develop, each with the germ of a coffee bean inside. The ripe fruit is plum red or orange, and ready for harvest. 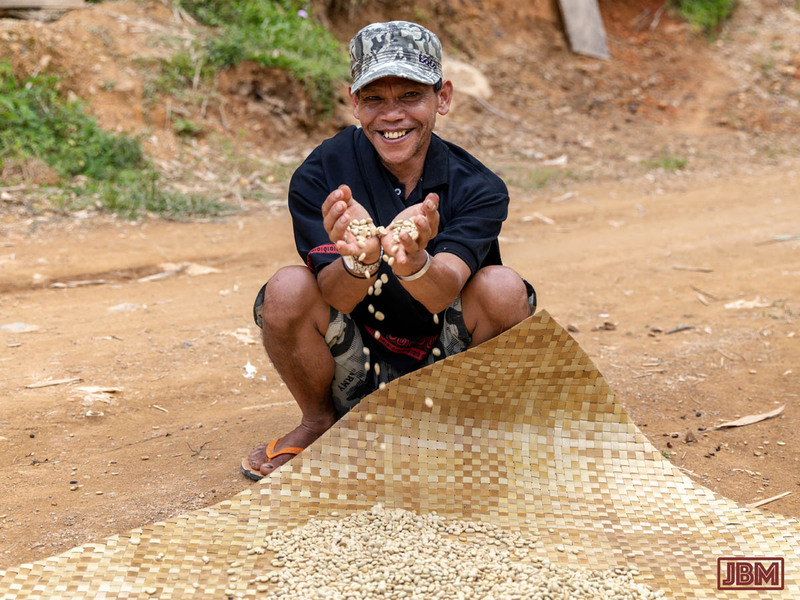 All Toraja coffee is hand-picked. 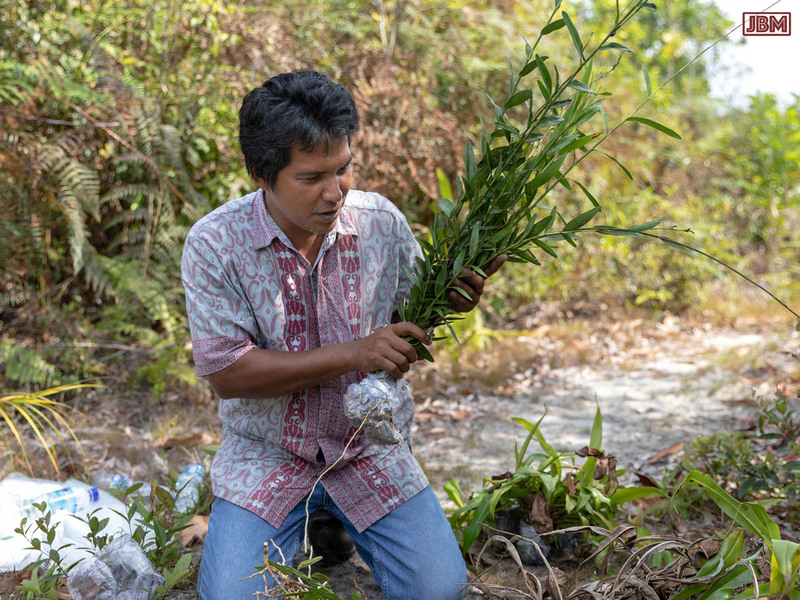 We didn’t witness the ‘giling basah’ processing technique (in which the fruit and husks are removed mechanically). We only saw the even more basic dry processing. Harvested fruit is laid out to dry (weather permitting) on woven mats, and then de-husked by hand. 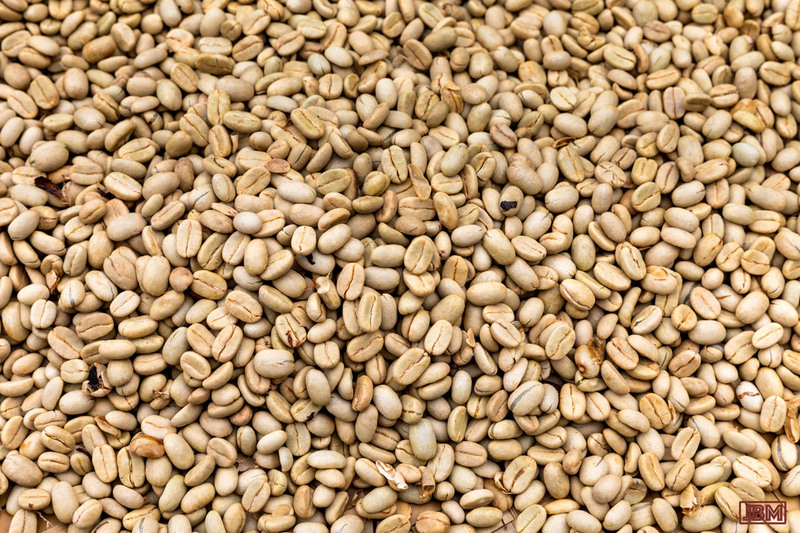 The raw coffee beans are then further dried in the sun, at which point they are ready for sale, or roasting and consumption. 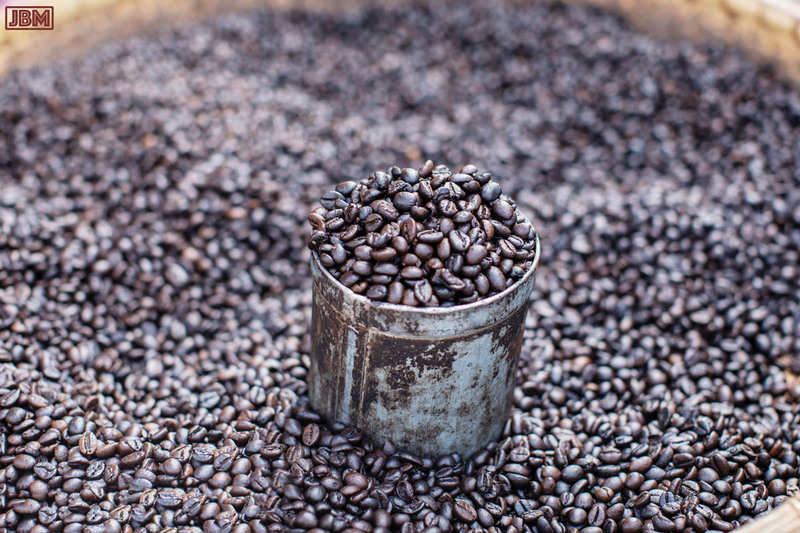 Bigger production houses will use kilns to roast the coffee beans. Some months ago in Jakarta we saw a huge shiny stainless steel roaster – with computer-controlled temperature, humidity, timers and agitation. 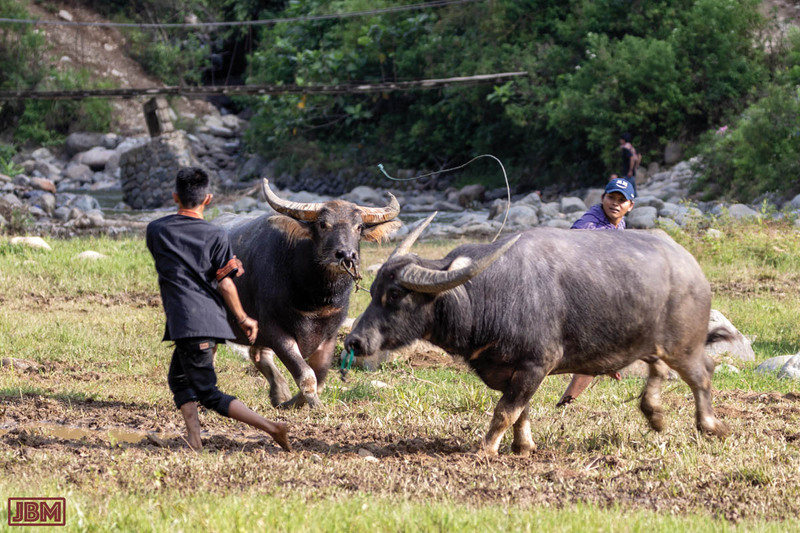 In the simpler environs of Torajan village, the process is a little more rudimentary – but no less effective. 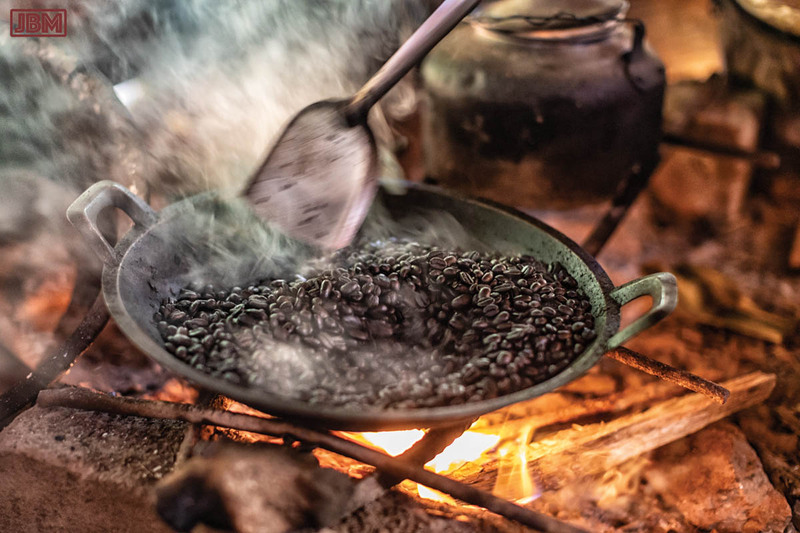 The beans are simply heated in a pan over a small fire until they acquire the appropriate colour and scent. Allow to cool, and… it’s all done. 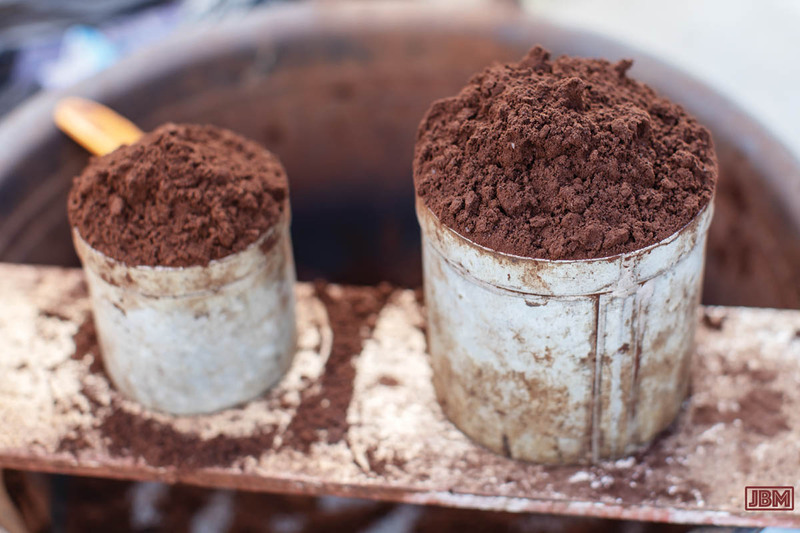 The roasted coffee beans are a rich purplish-chocolate colour, with a nice sheen. 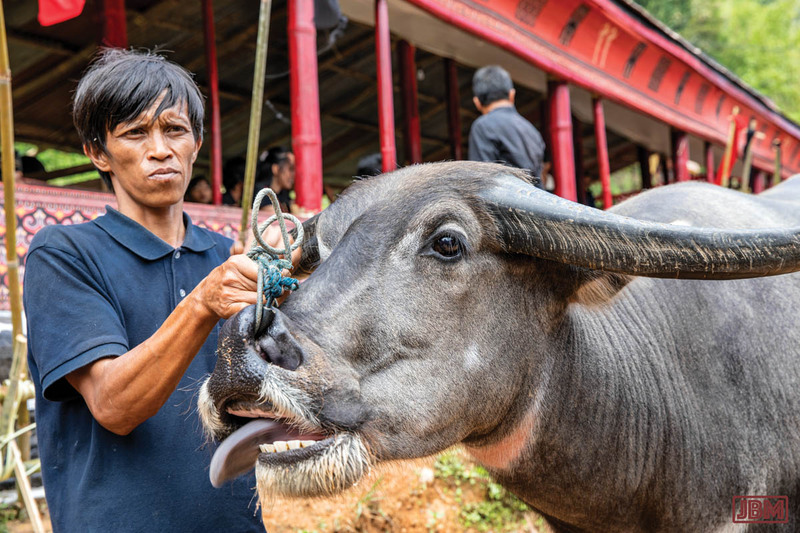 I like the intense flavour and crunch that results from biting on a fresh-roasted coffee bean – like these ones at the Pasar Bolu in Rantepao. 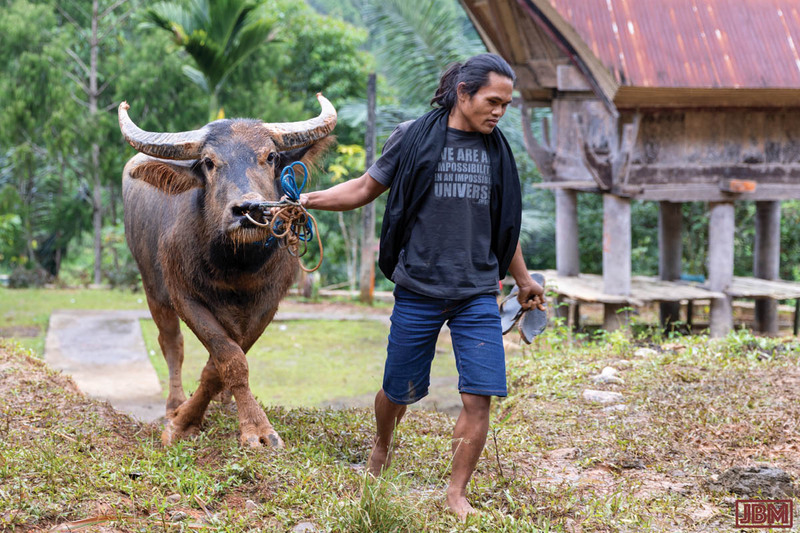 The Toraja region of South Sulawesi is deservedly famous for its buffalo – but Torajans are also proud of their roosters. 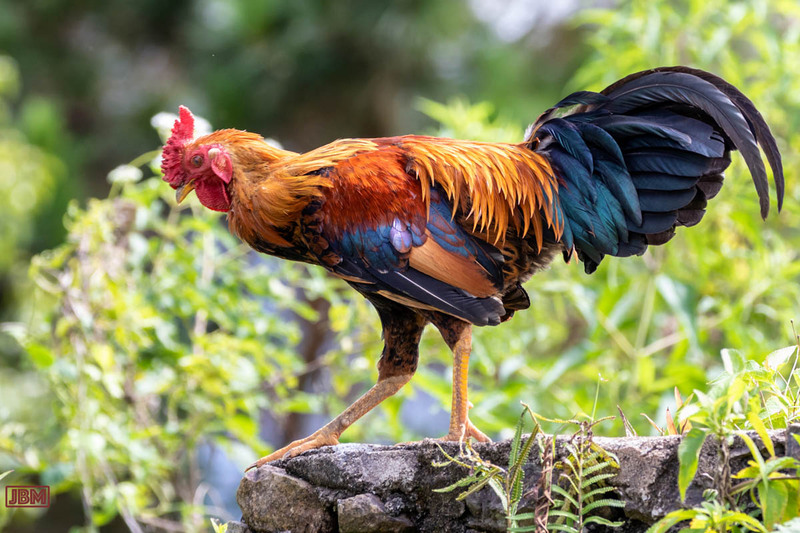 Brightly coloured, lean and athletic, and (dare I say it) looking rather cocky as they strut around. 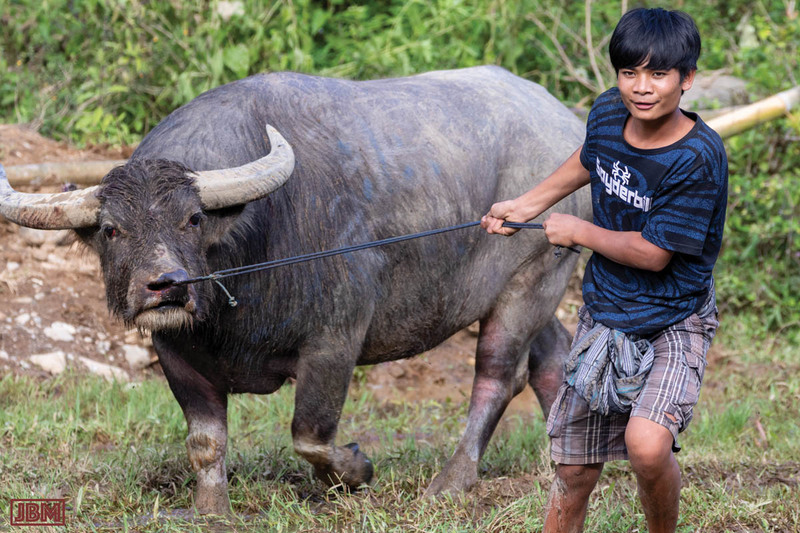 Water buffalo generally give the appearance of being placid – slow dull gentle giants. Bovine, even. 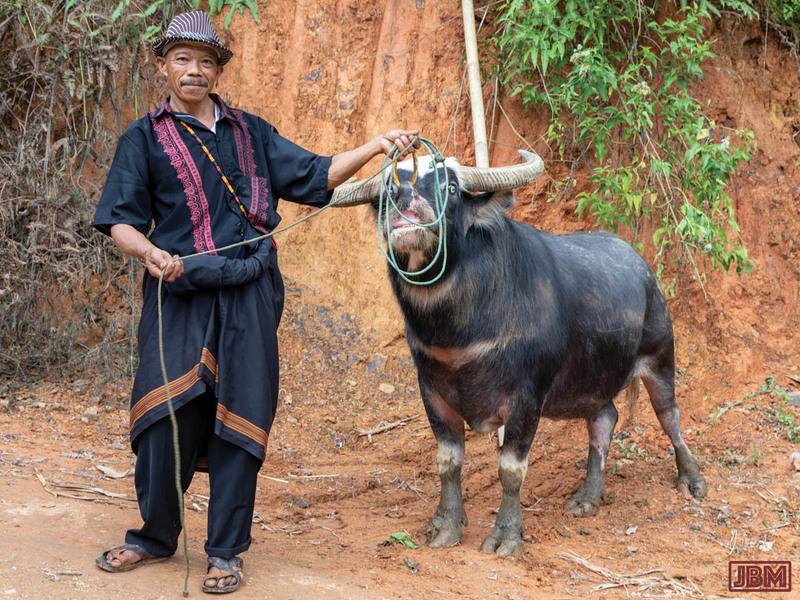 500+ kilos of docility. But when they fight, they reveal quite a different dimension. 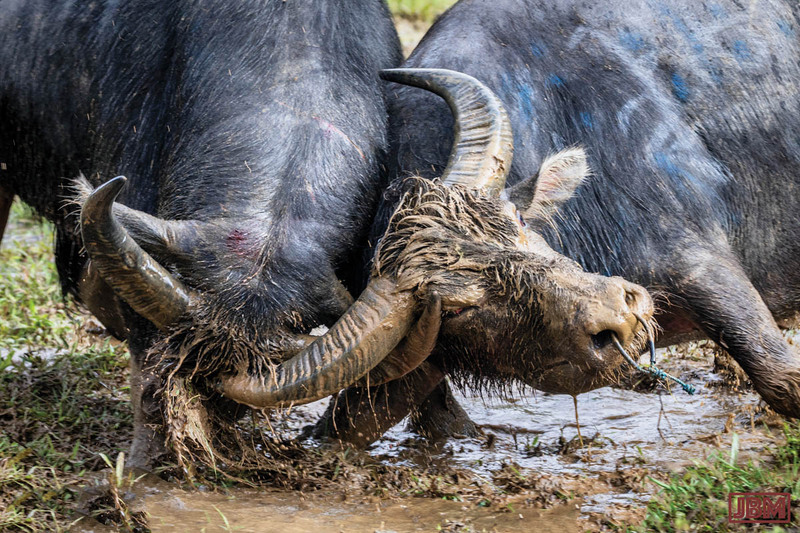 There’s a loud clashing of heads, a locking of horns, and then they use their thick muscular necks to try and overwhelm their opponents. 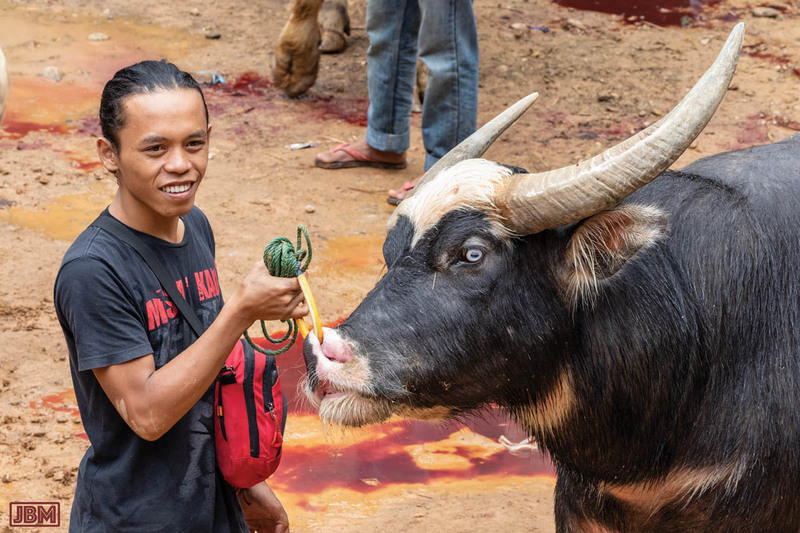 And those phenomenal horns can (and do) inflict serious wounds. 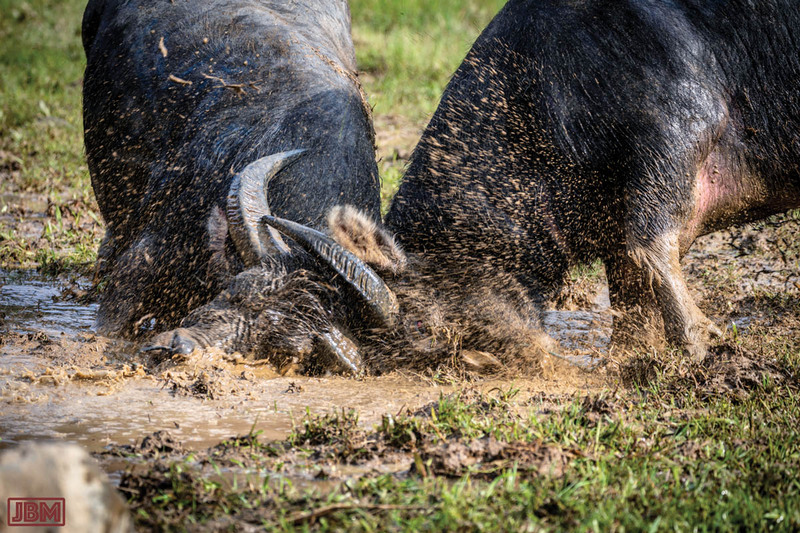 It can go on for some minutes, with mud (and maybe some blood) flying as they collide. 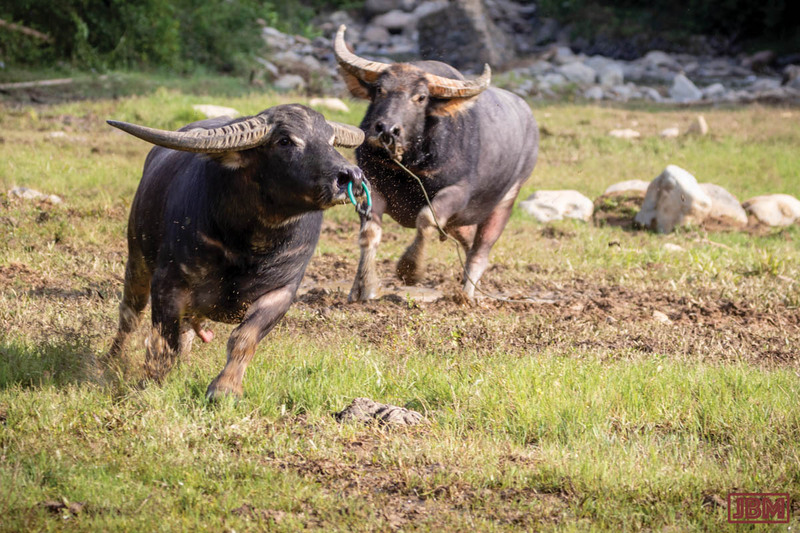 Eventually one triumphs, and the vanquished buffalo runs away, closely pursued by the victor. Any humans in the vicinity had best get out of the way!